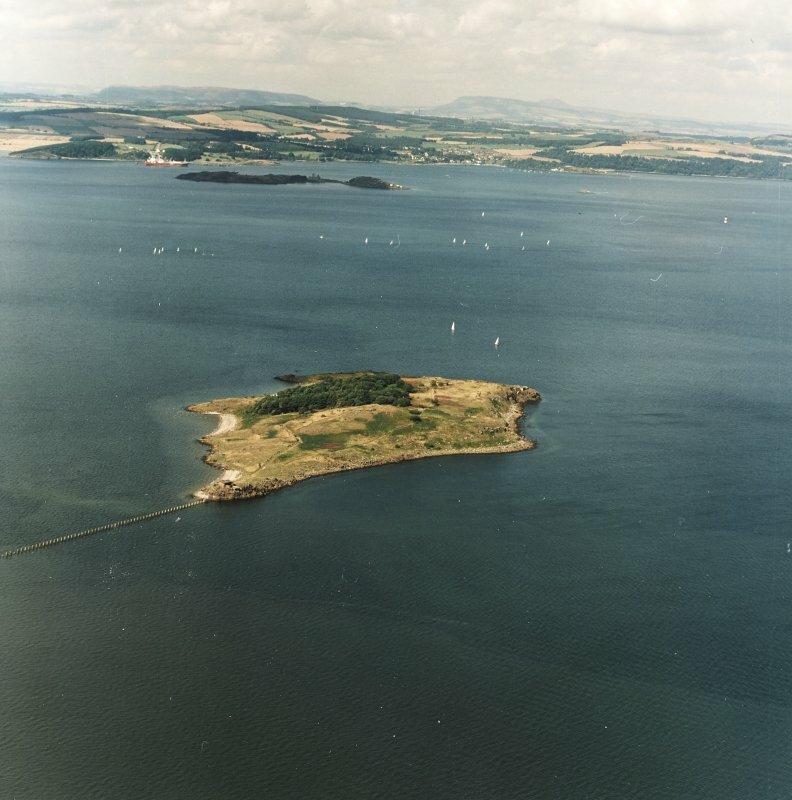 General oblique aerial view looking across Cramond Island towards Inchcolm Abbey and Aberdour, taken from the SE. 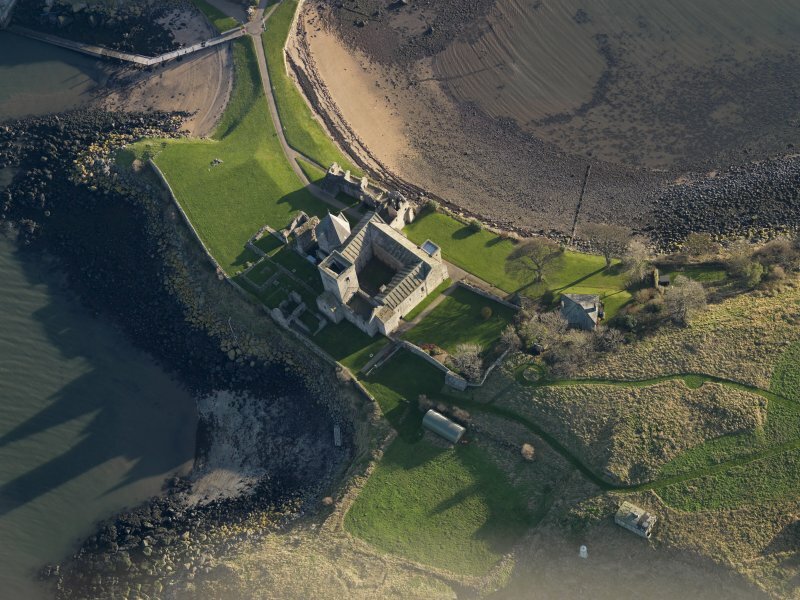 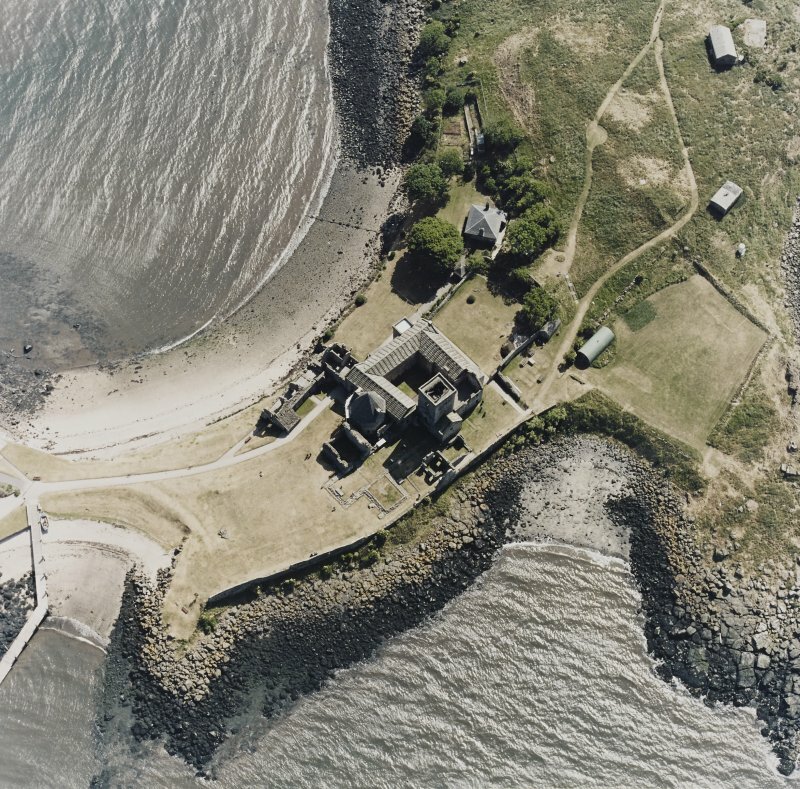 Oblique aerial view centred on the abbey with coast batteries adjacent , taken from the SSE. 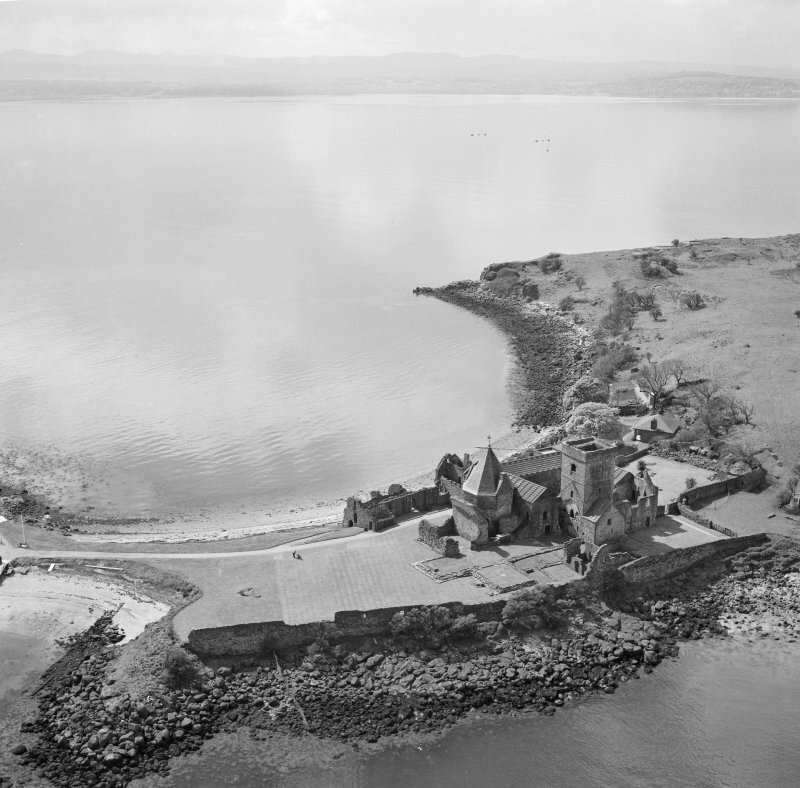 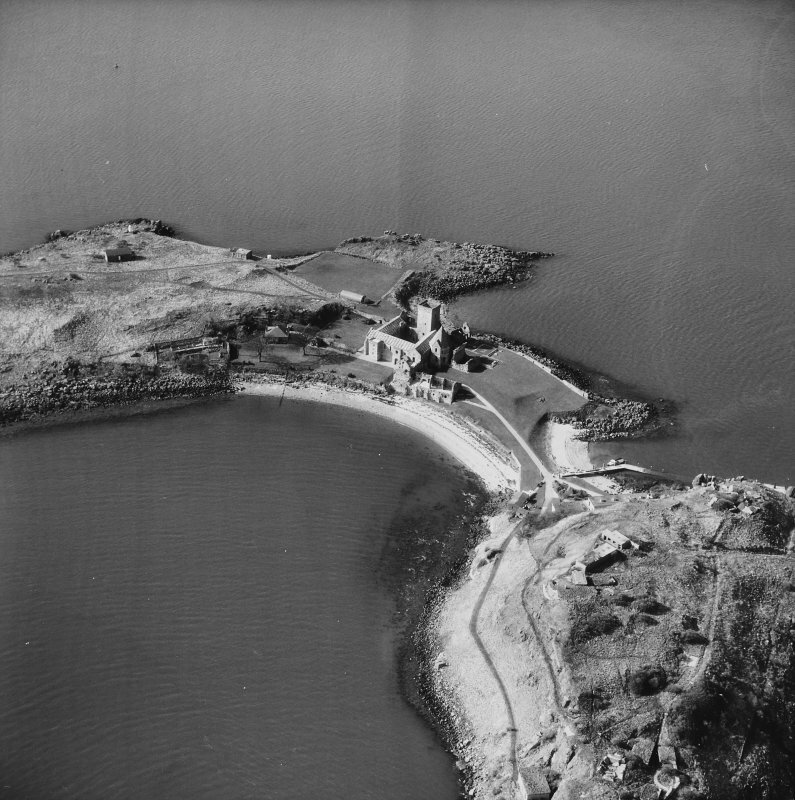 Inchcolm Island, oblique aerial view, taken from the W, showing a general view of the island, with Inchcolm Abbey and four coastal batteries visible. 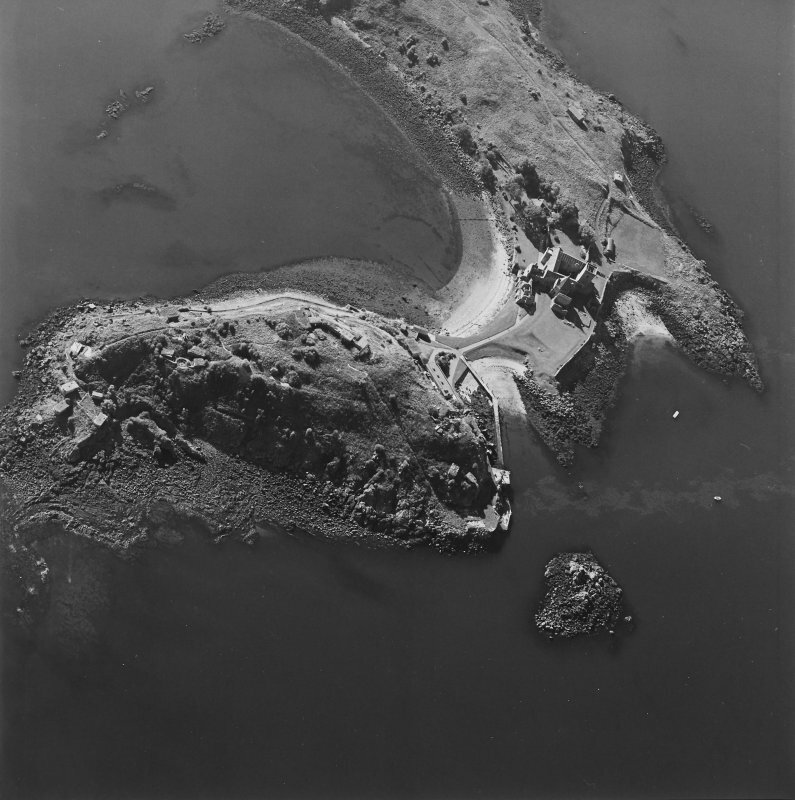 Inchcolm Island, oblique aerial view, taken from the W, showing Inchcolm Abbey and four coastal batteries. 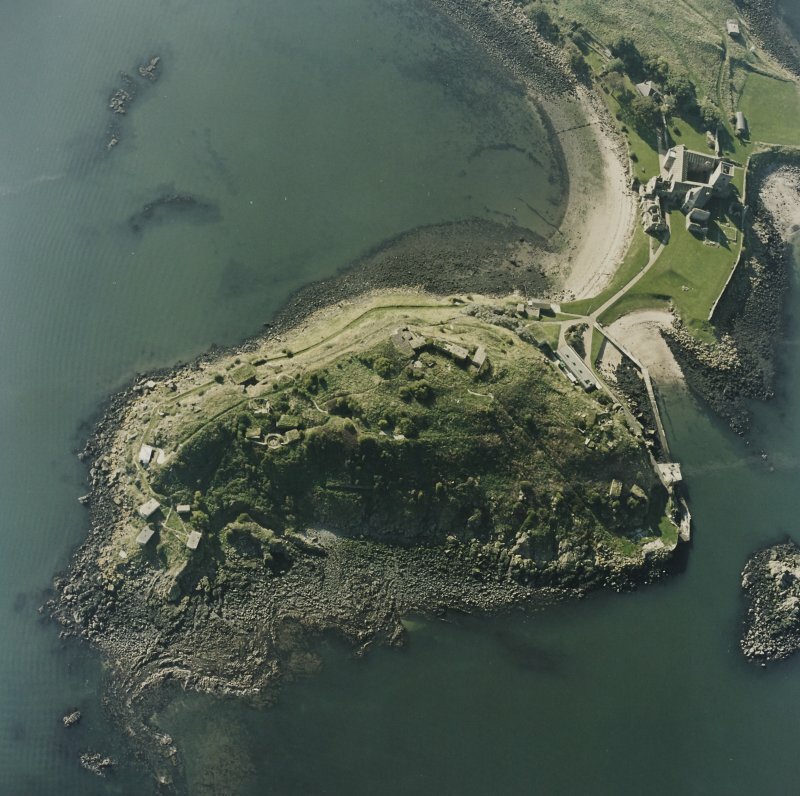 Inchcolm Island, oblique aerial view, taken from the W, showing Inchcolm Abbey and three coastal batteries. 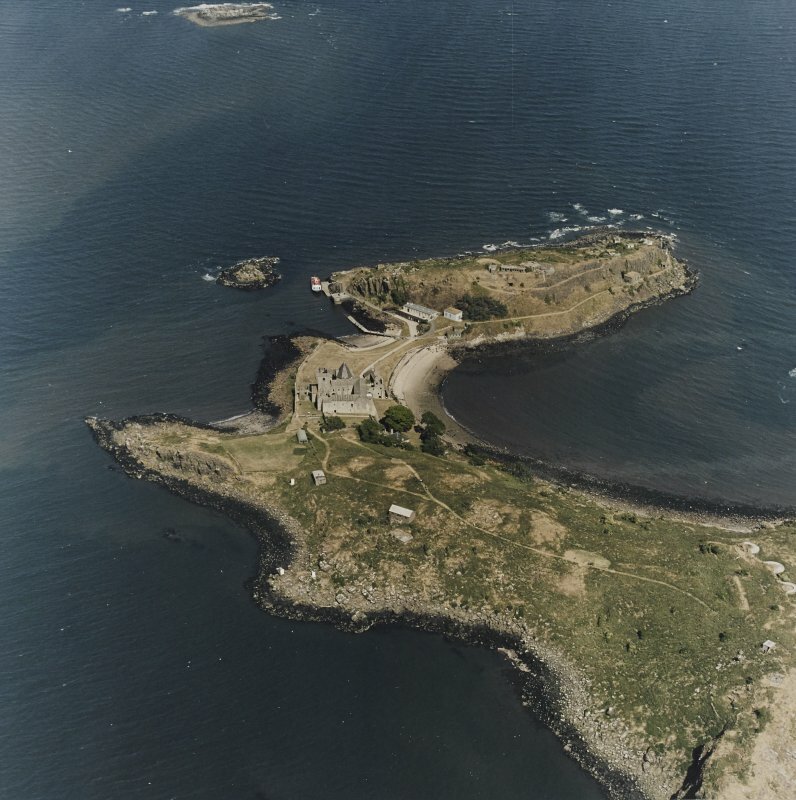 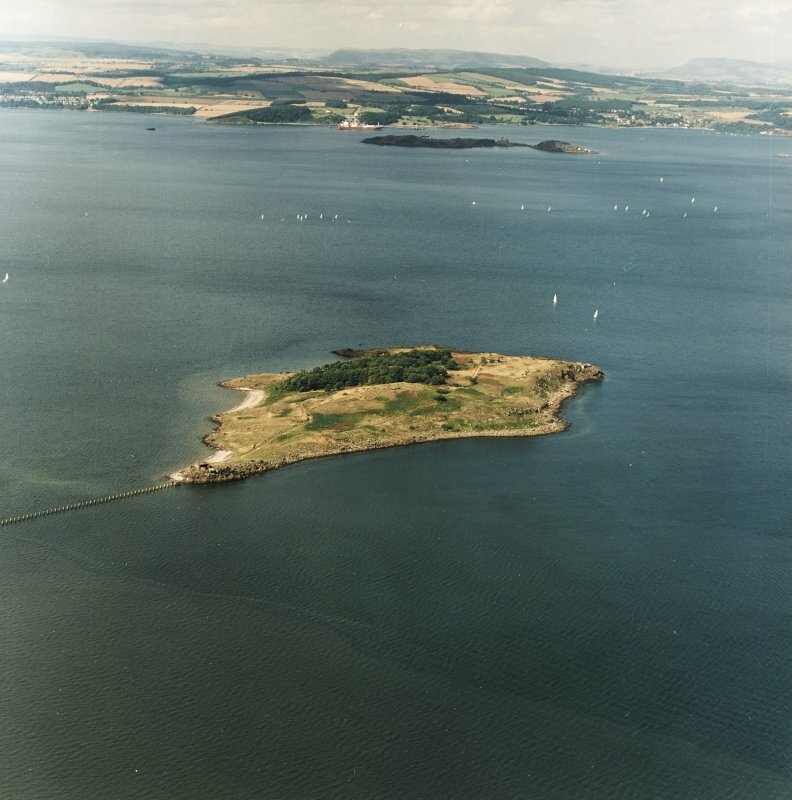 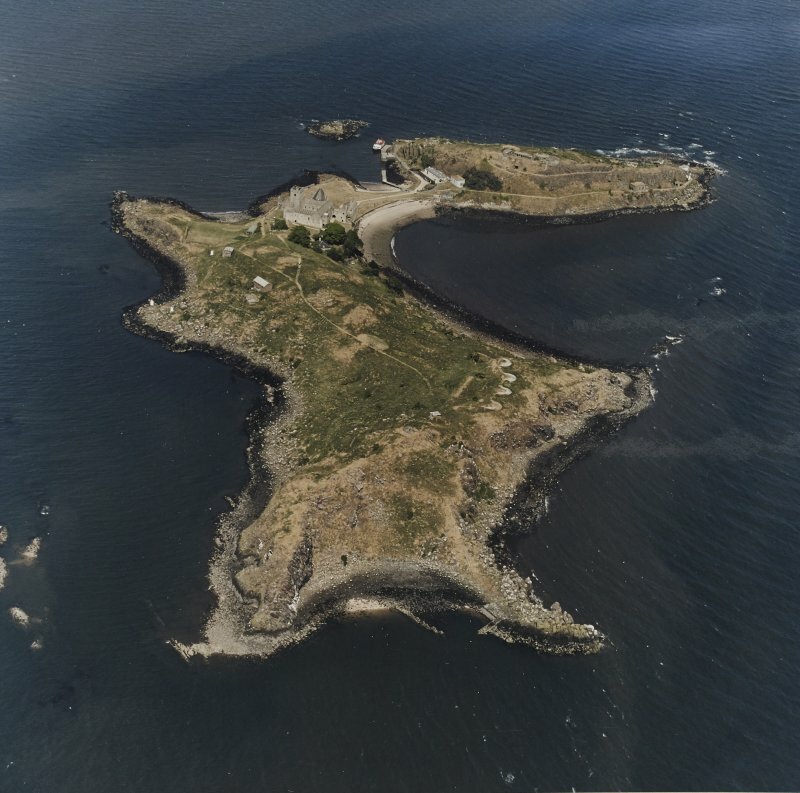 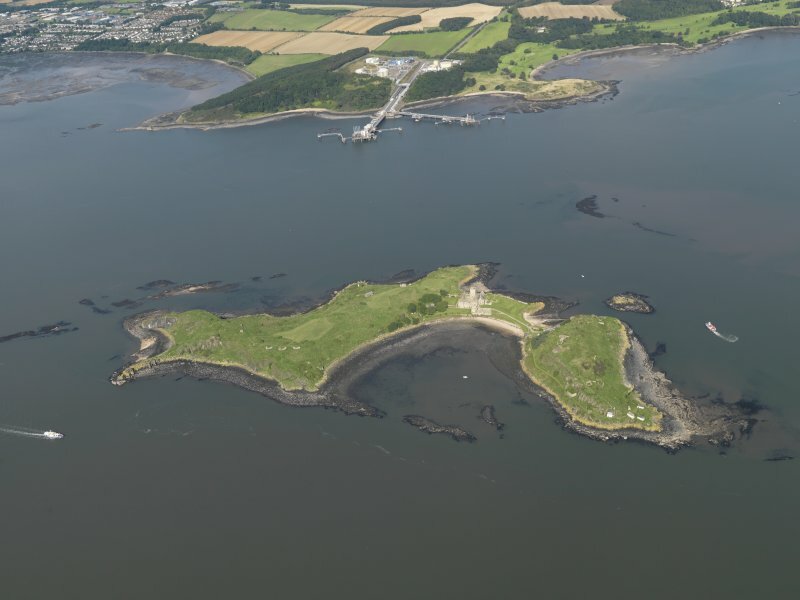 Inchcolm Island, oblique aerial view, taken from the NE, centred on Inchcolm Abbey. 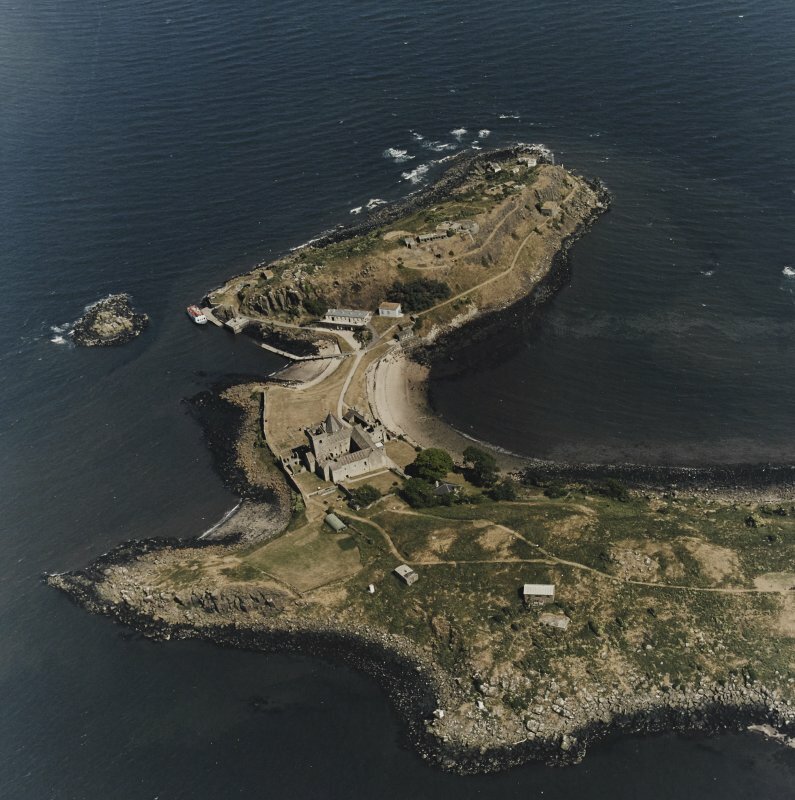 Inchcolm Island, oblique aerial view, taken from the SW, centred on a coast battery, with Inchcolm Abbey and three coastal batteries visible in the background. 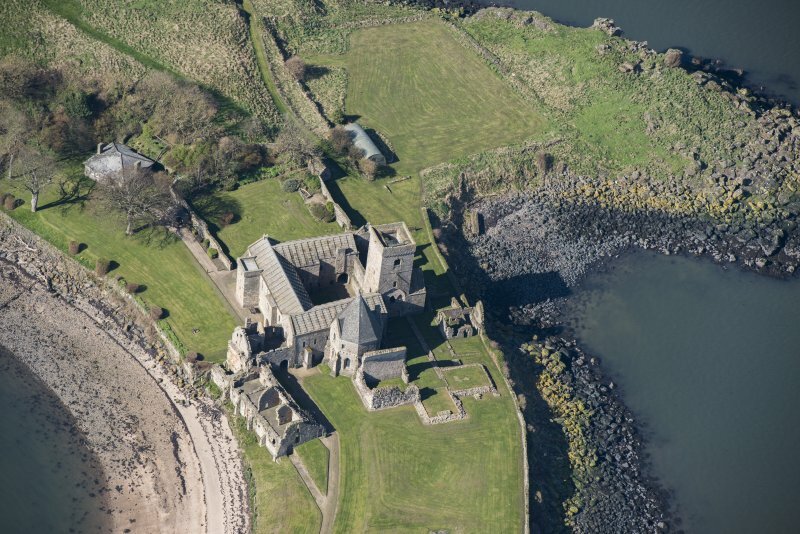 Oblique aerial view centred on the Abbey, taken from the NW. 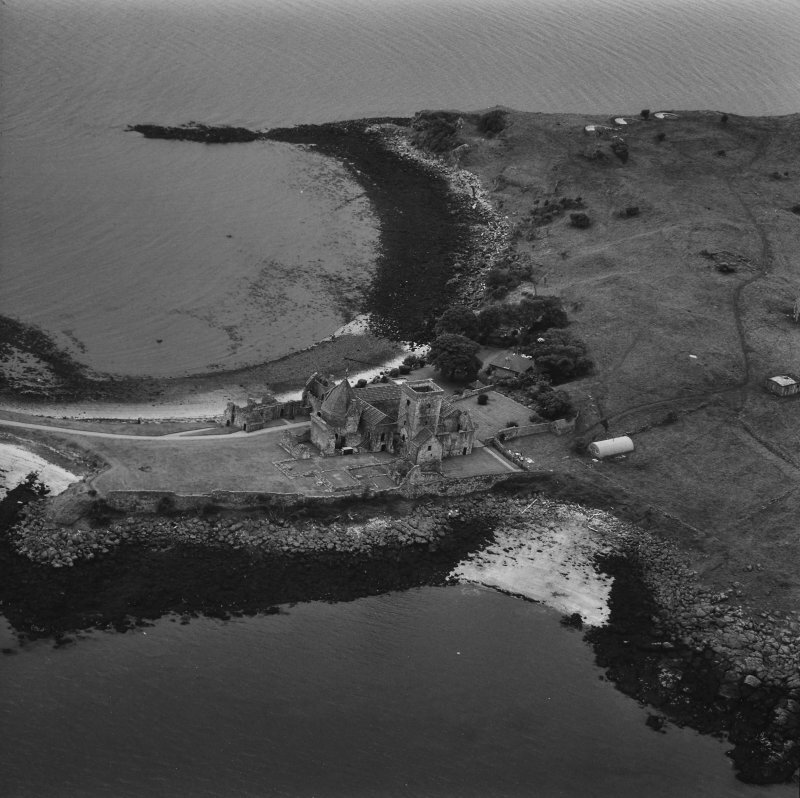 View of Chapter House and Lady Chapel from N.
General oblique aerial view looking across Cramond Island towards Inchcolm Abbey and Dalgety Bay, taken from the ESE. 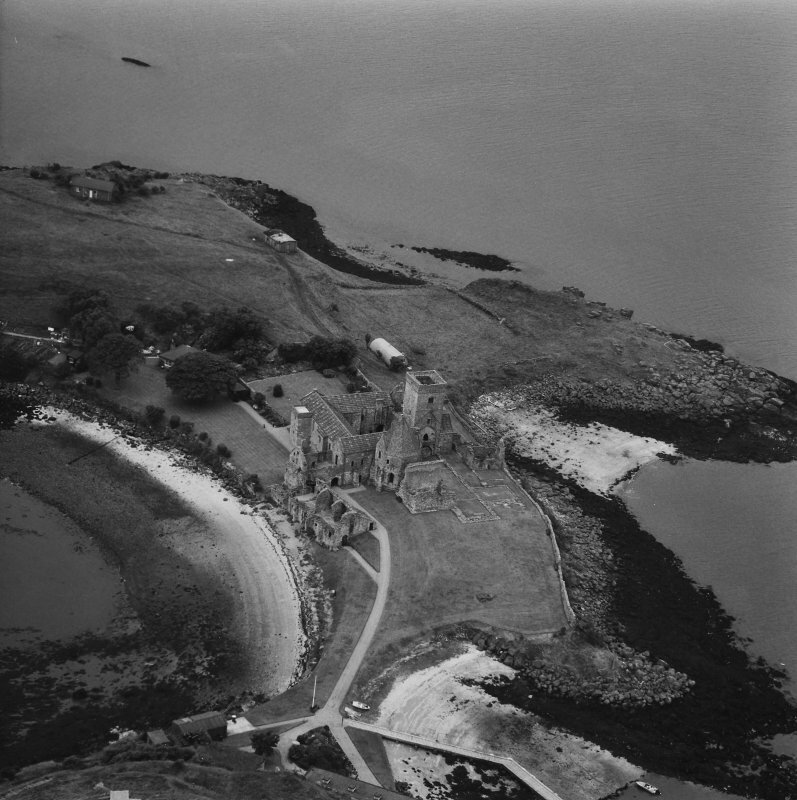 Oblique aerial view centred on the abbey with coast batteries adjacent, taken from the NW. 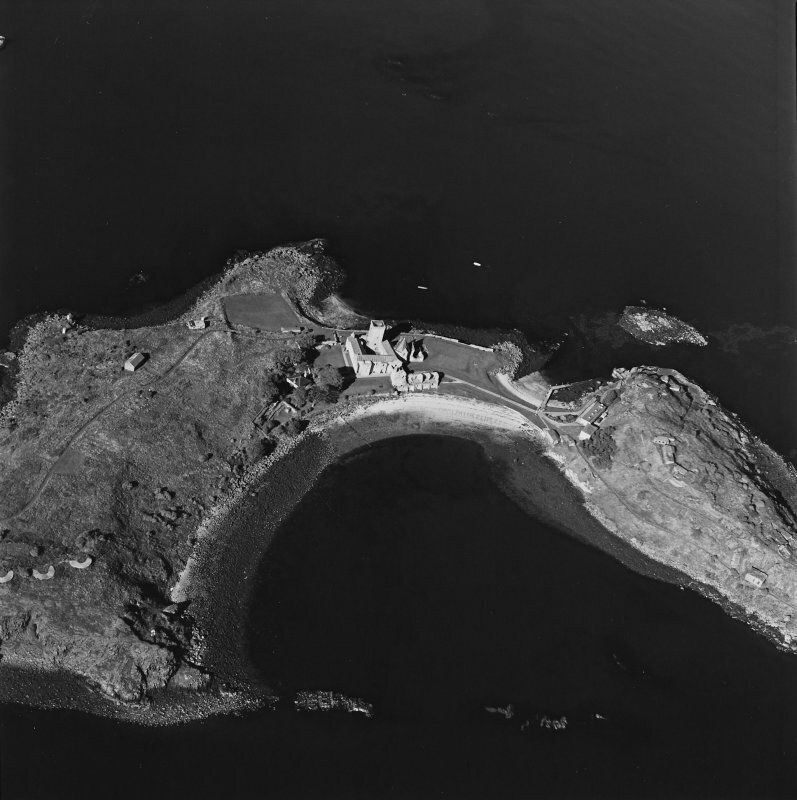 Oblique aerial view centred on the coast batteries with abbey adjacent, taken from the NE. 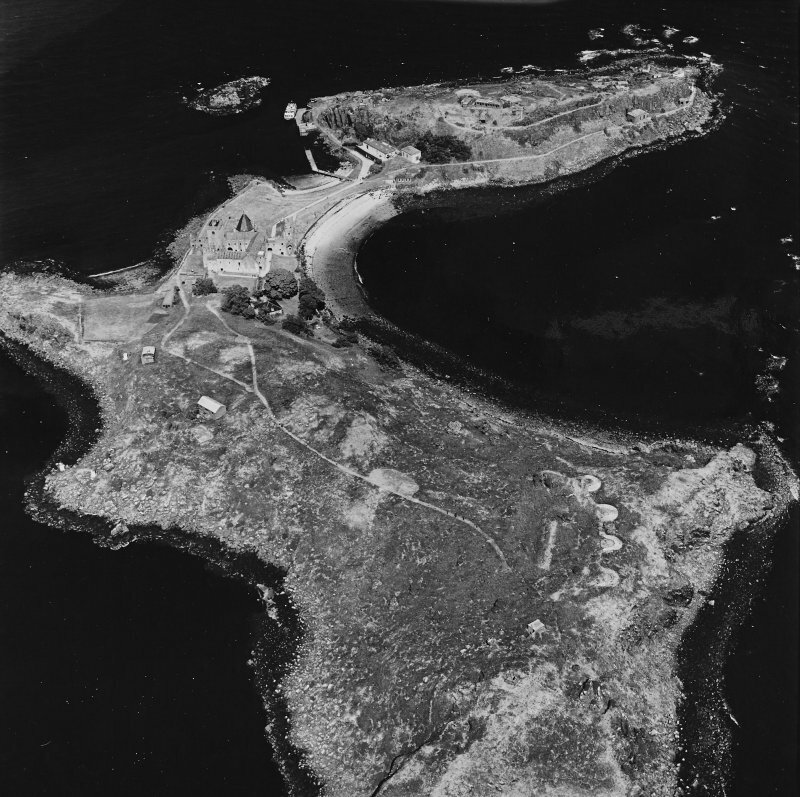 Oblique aerial view centred on the coast batteries with abbey adjacent, taken from the NNE. 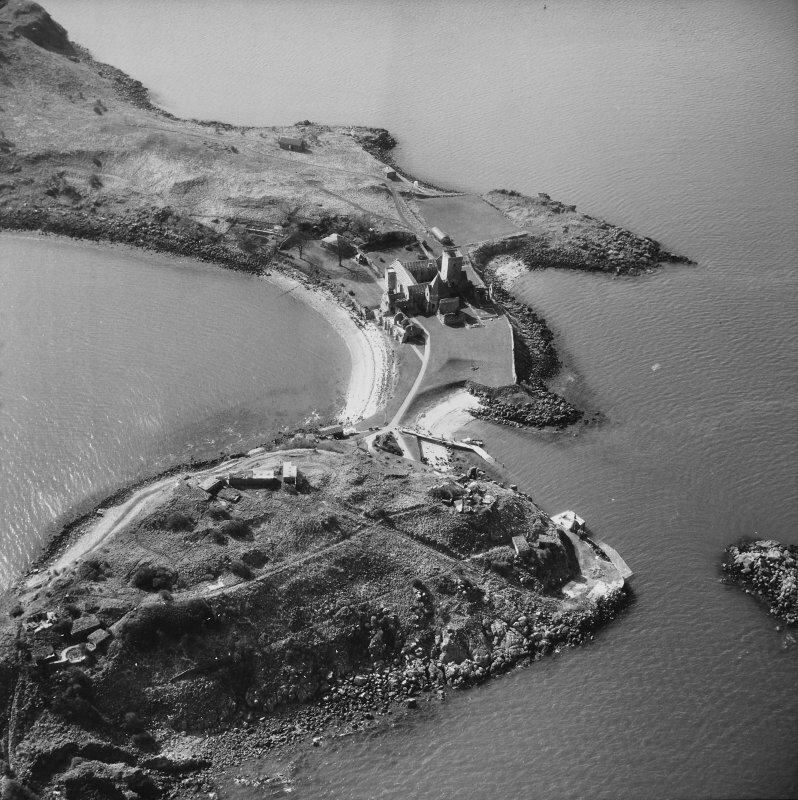 Inchcolm Island, oblique aerial view, taken from the SE, showing Inchcolm Abbey and a coast battery. 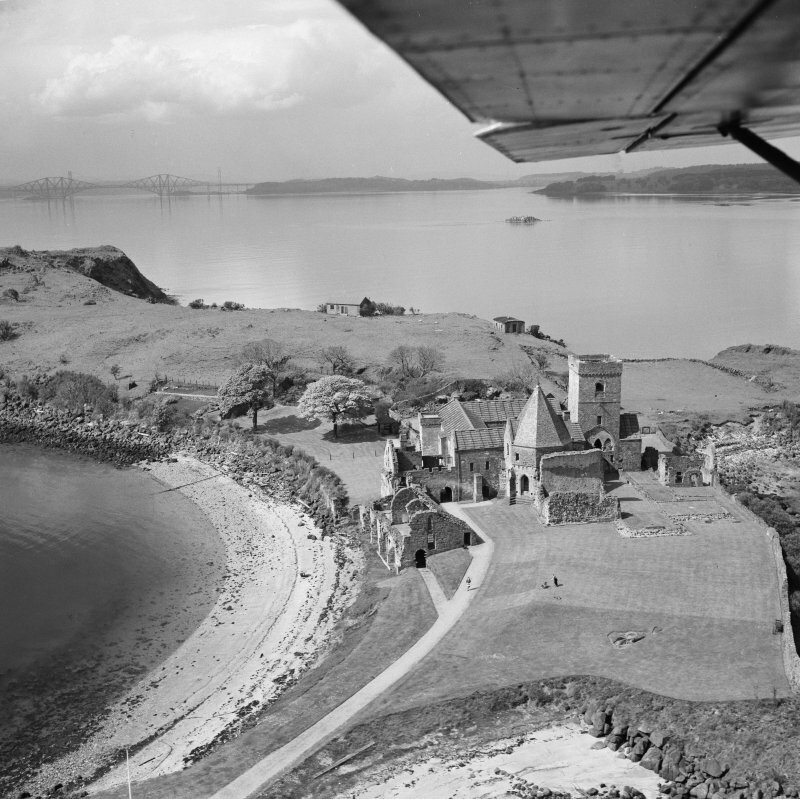 Oblique aerial view of Inchcolm Abbey showing the Forth Bridge in the distance. 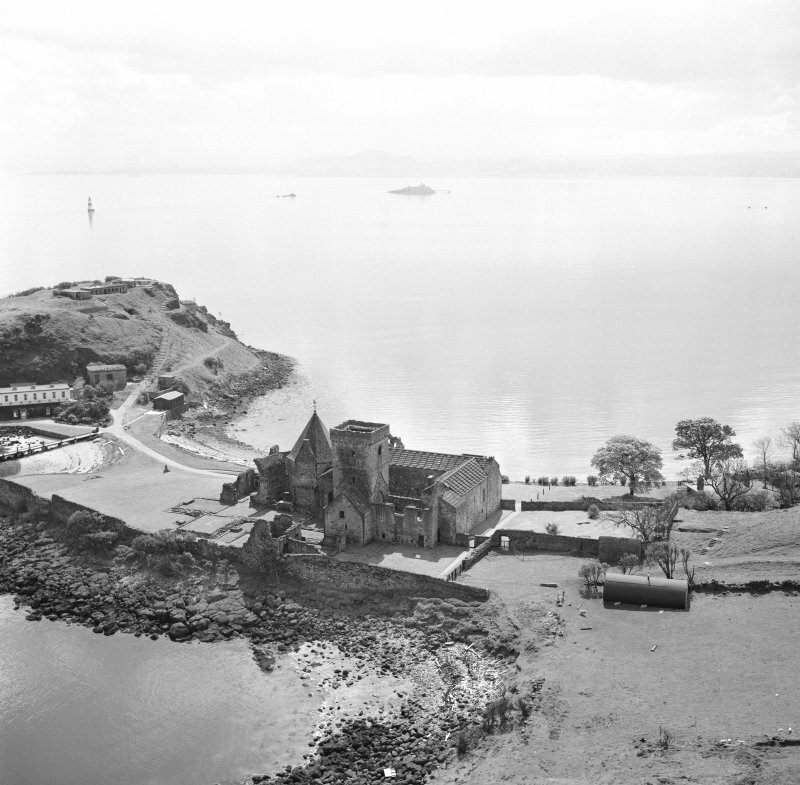 General oblique aerial view of Inchcolm, taken from the SSE. 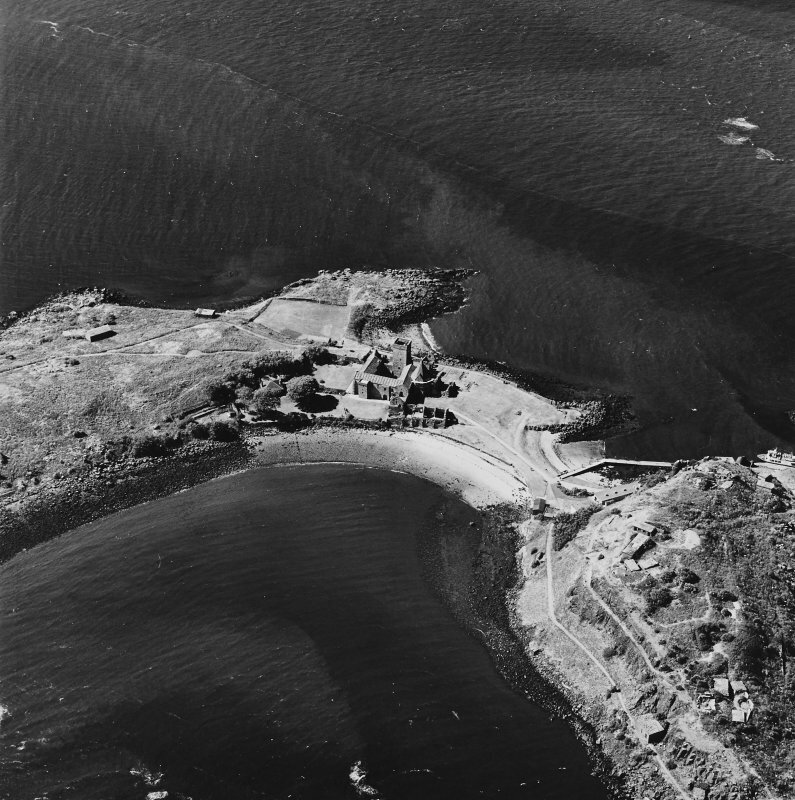 Oblique aerial view of Inchcolm, taken from the SW. 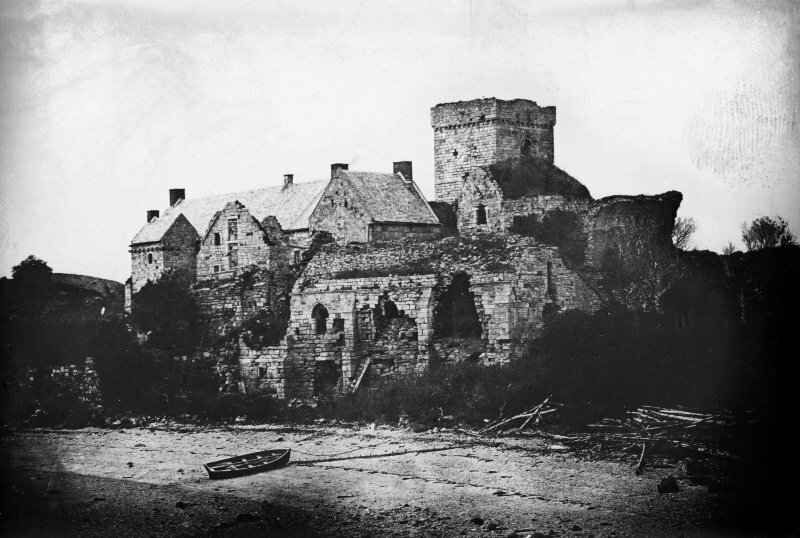 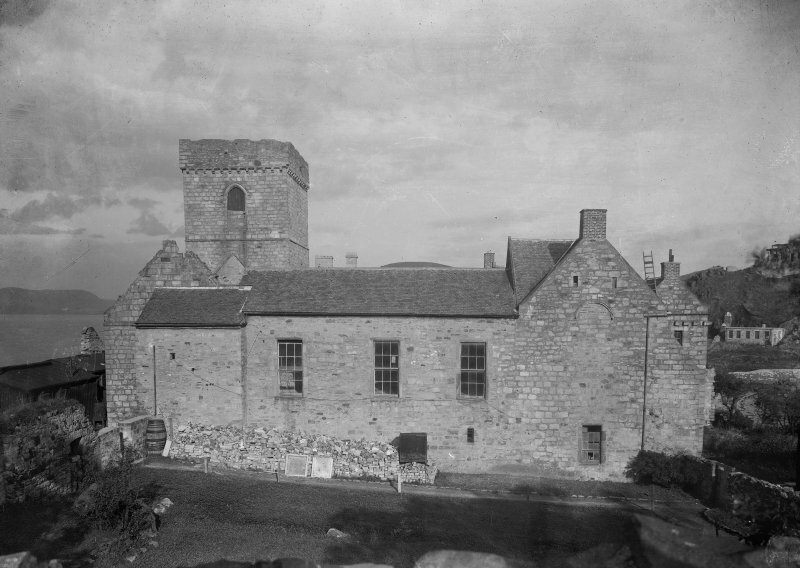 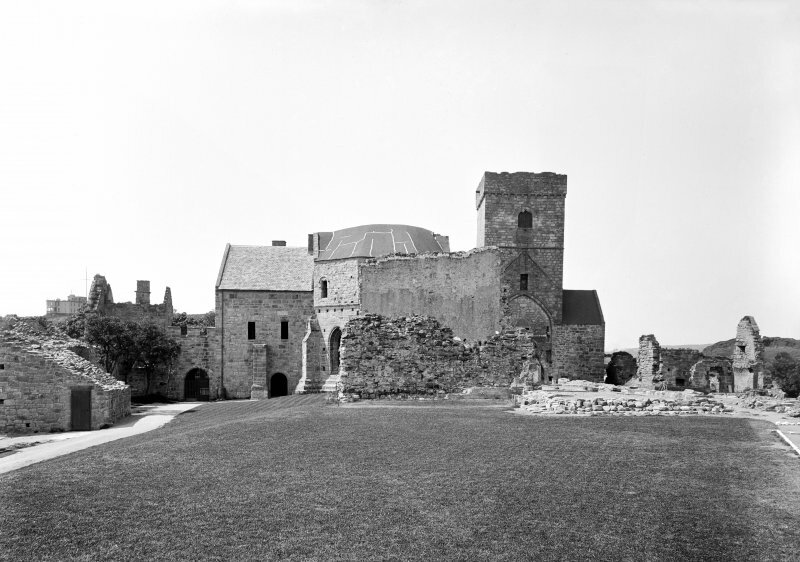 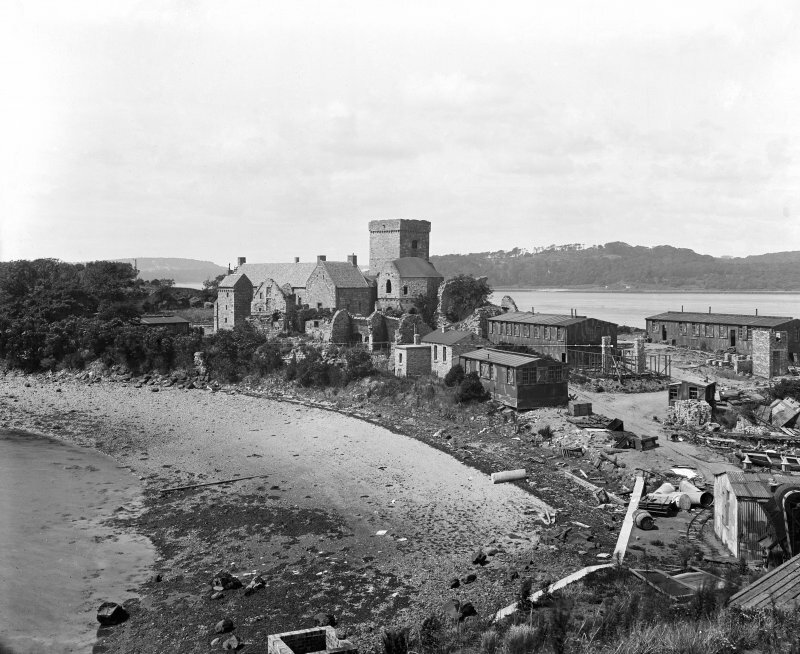 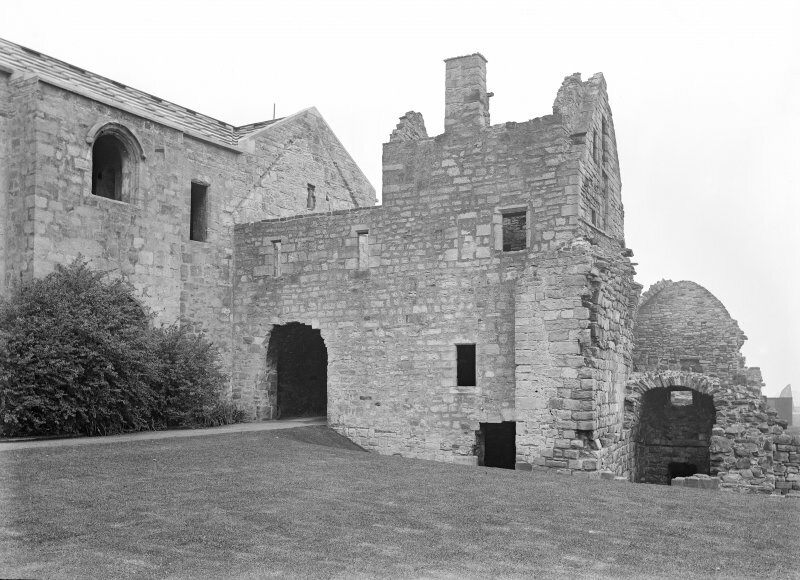 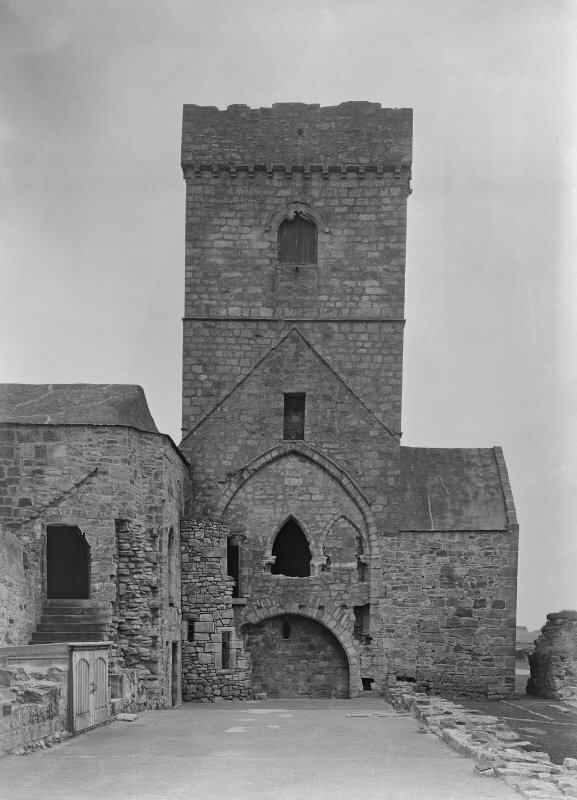 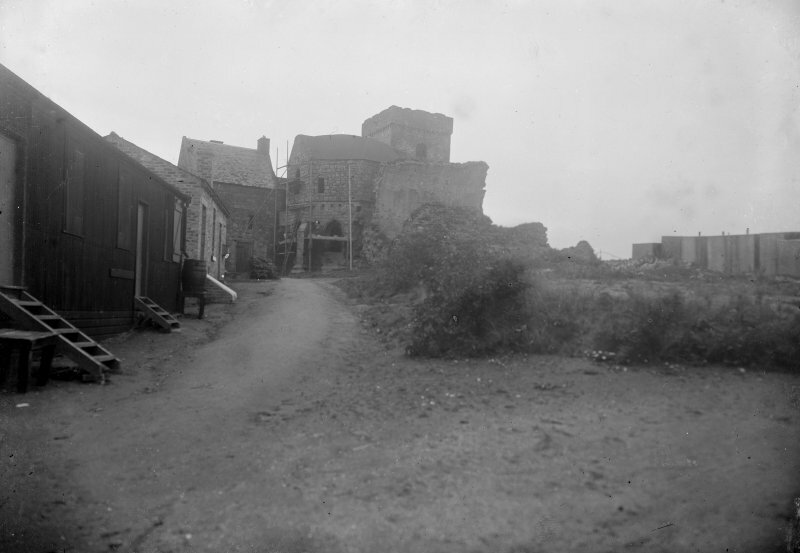 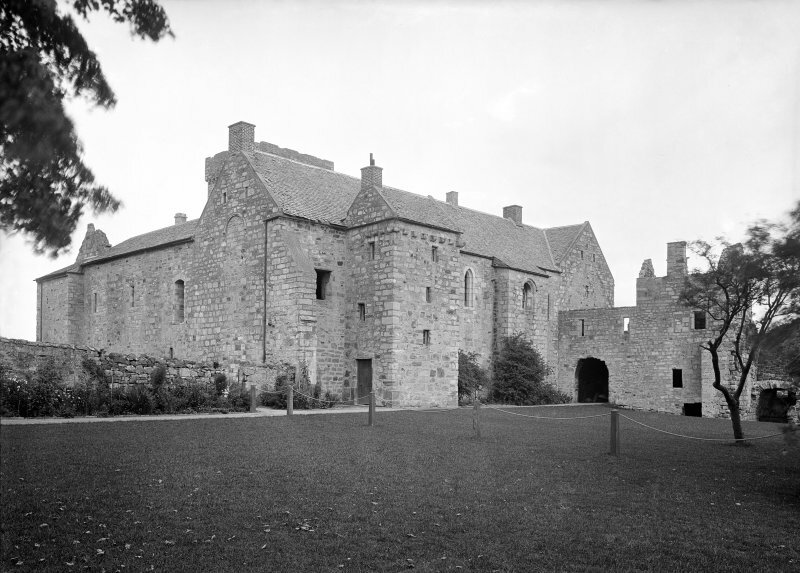 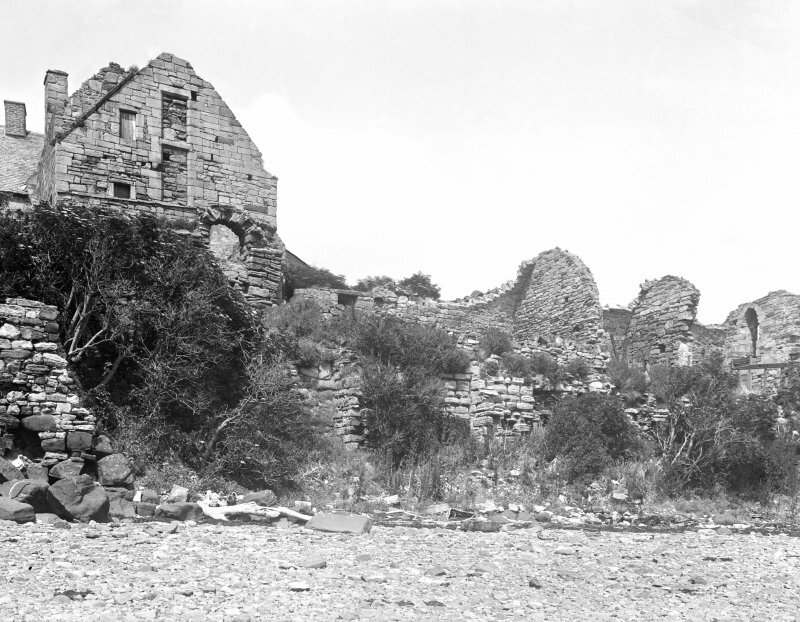 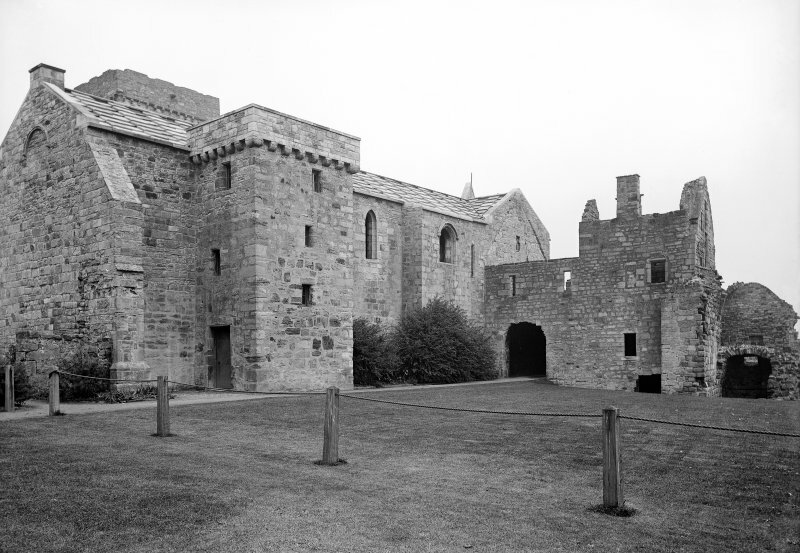 The Augustinian Abbey at Inchcolm, which may well have been erected over a Celtic settlement, was founded by Alexander I about 1123, and erected from a priory into an Abbey in 1235. 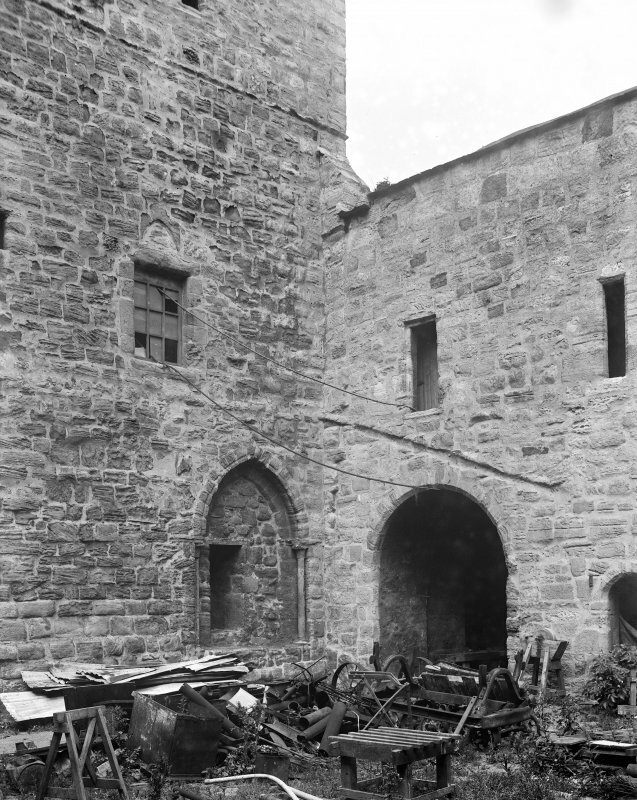 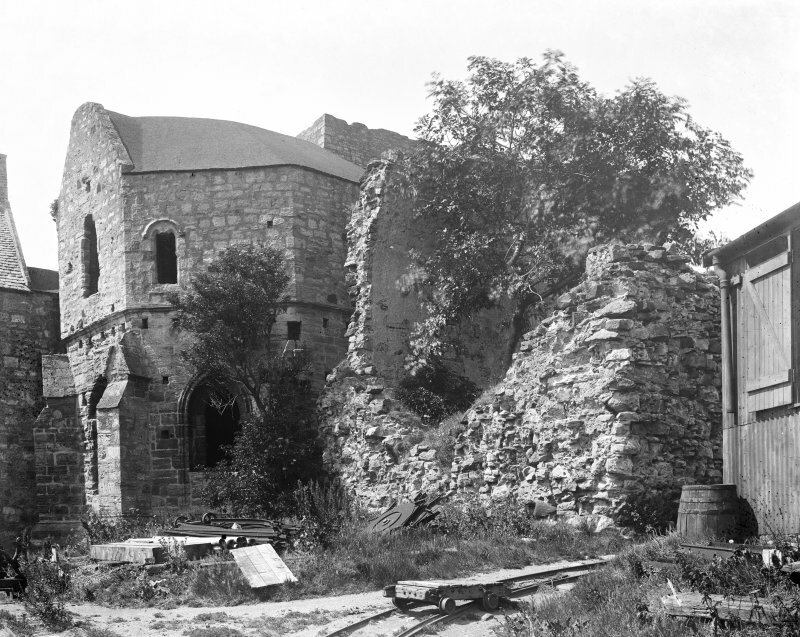 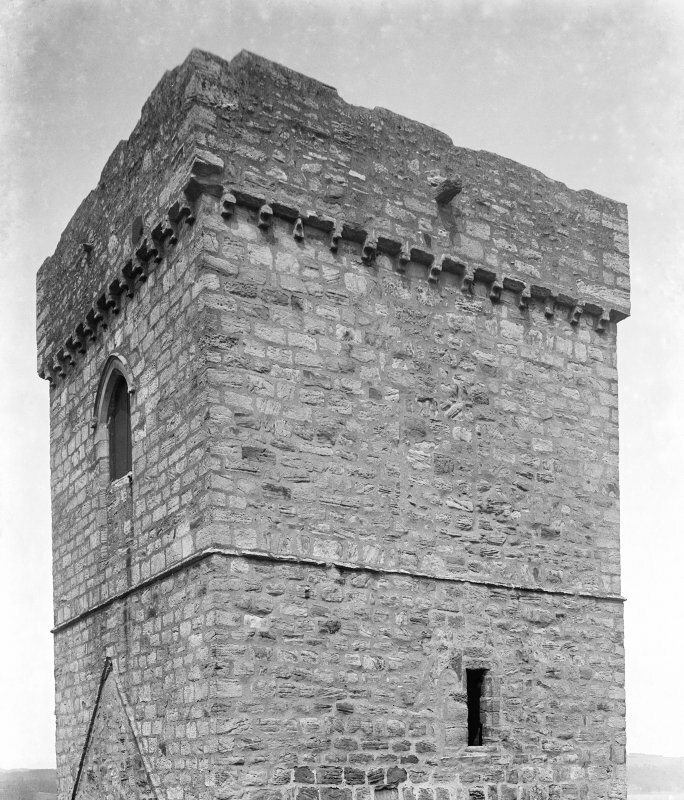 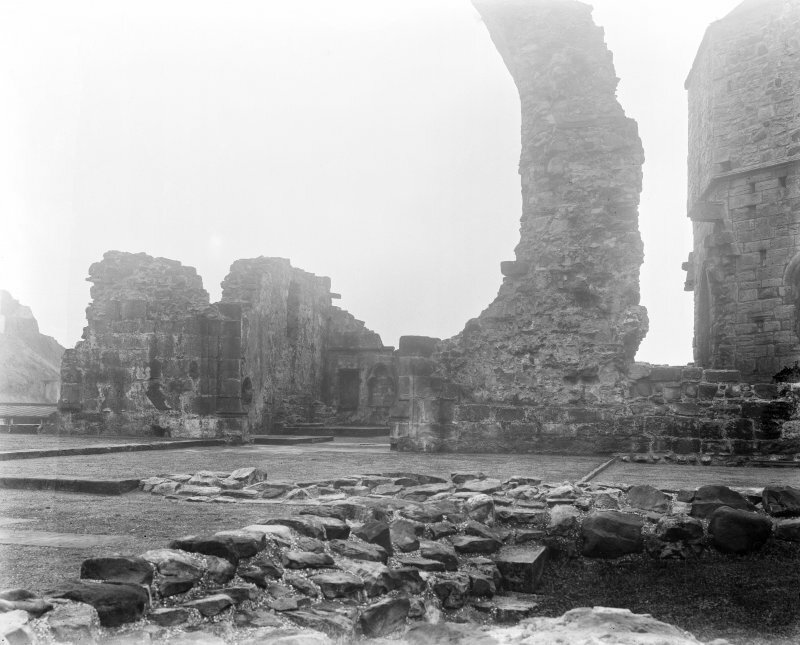 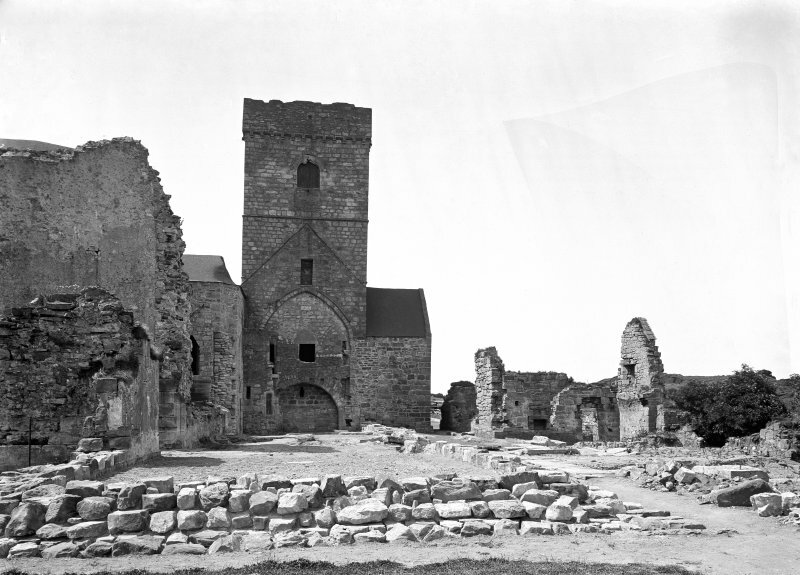 The substantial ruins, which are fully described in the Official Guide book (J W Paterson 1950), date from the 12thc, with frequent additions and alterations up to the 15thc. 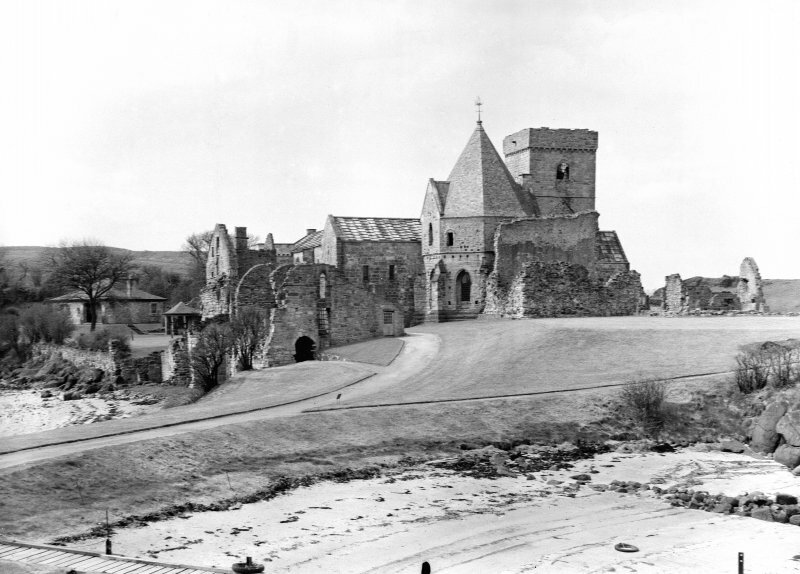 The abbey and its lands were secularised in 1609. 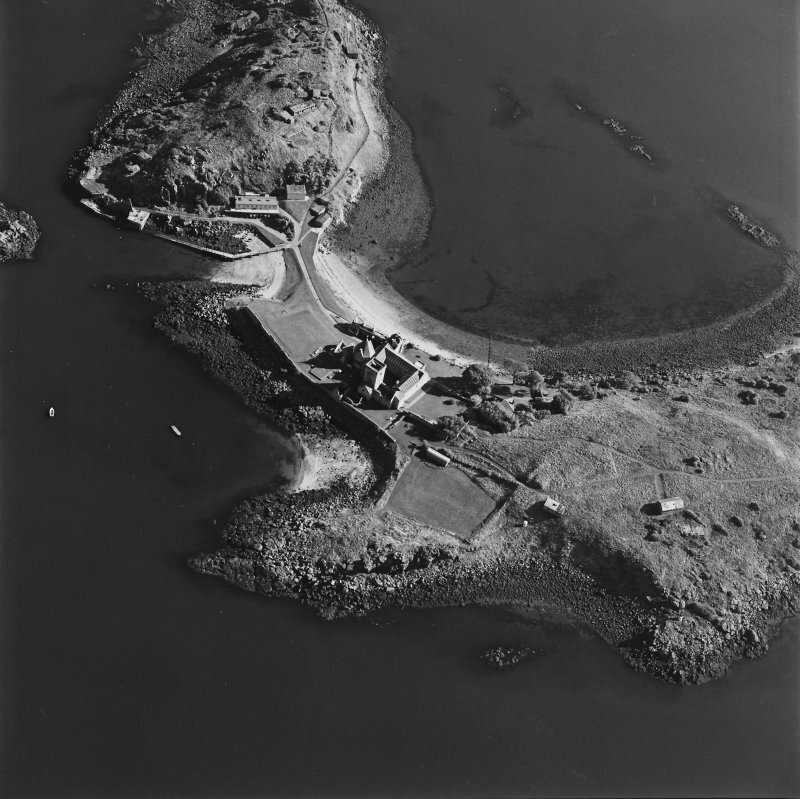 D E Easson 1957; S Cruden 1960; J W Paterson 1950. 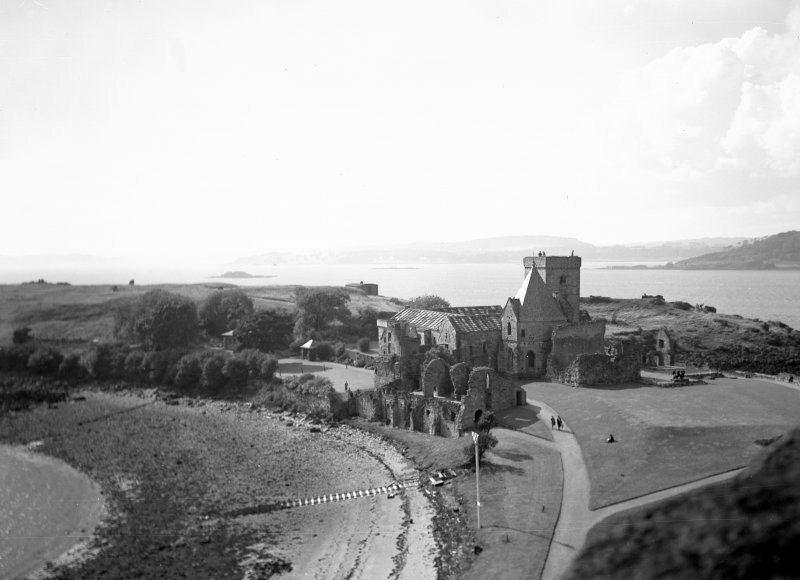 Inchcolm Abbey, as described, is in an excellent state of preservation. 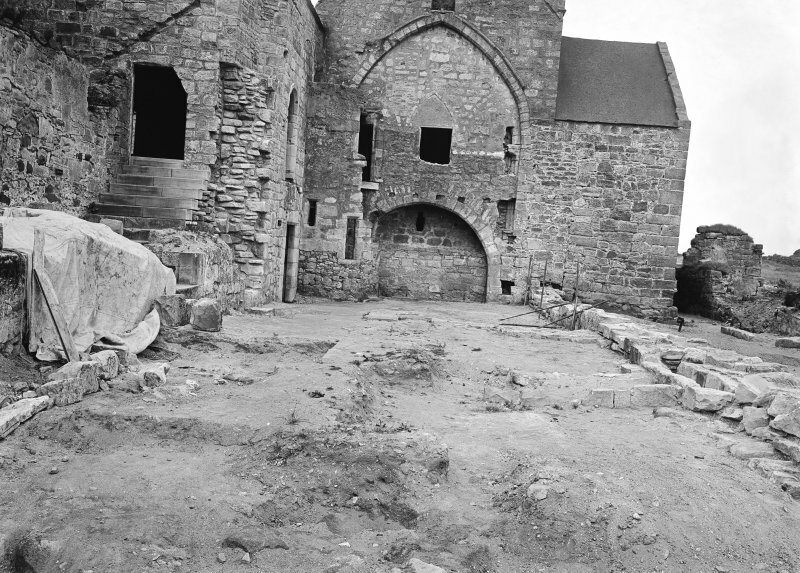 Excavation in advance of a drain trench showed that the N wall of the 13th century chapter house belonged to an earlier building lying to the N. To the S fragmentary walls suggested buildings lying to the S of the chapter house and E of the gateway. 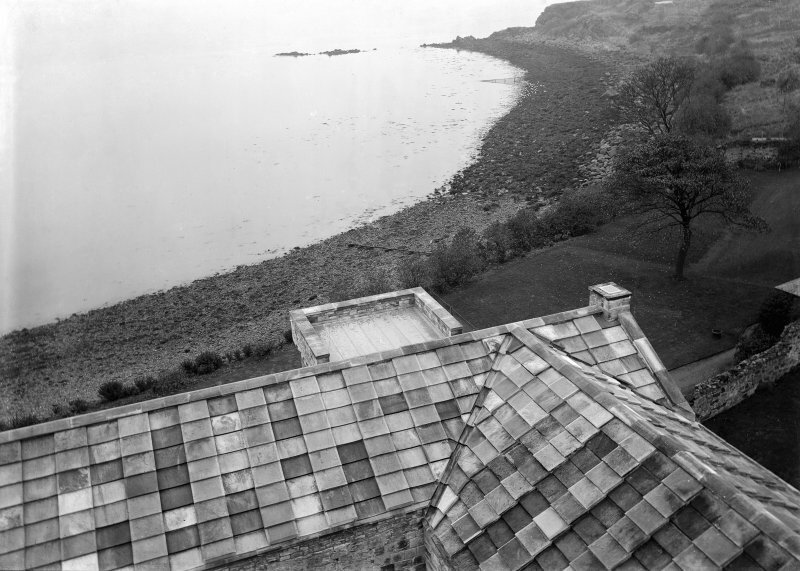 A watching brief was kept by Scotia Archaeology Ltd during the excavation of two pits to house bioplus treatment tanks: one (Trench 1) adjacent to the visitor centre; the other (Trench 2) against the custodian's house. 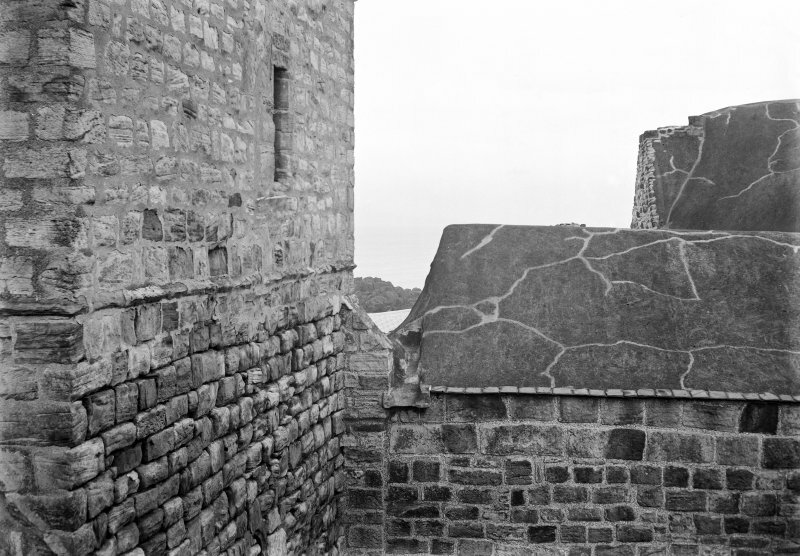 In Trench 1, 0.4m of modern materials overlay a deposit of massive boulders, some of them cement-bonded, which formed the rear of the modern sea wall. 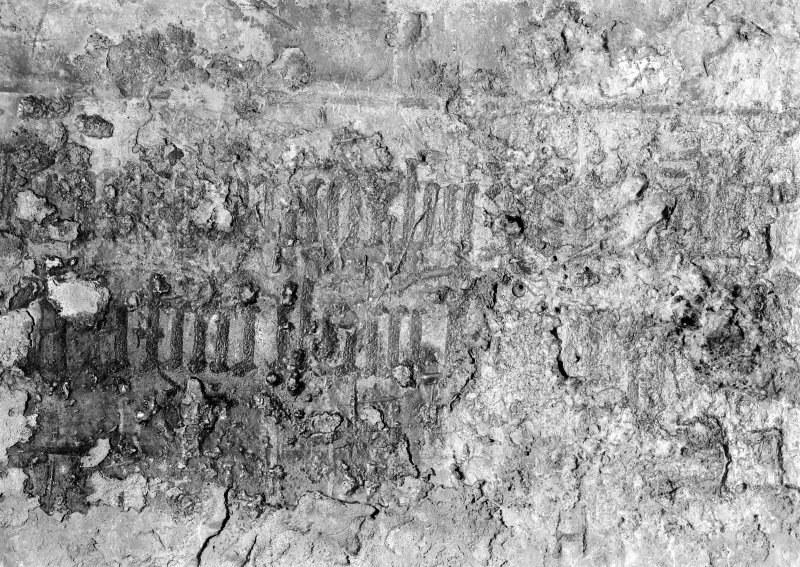 Below 0.3m of topsoil in Trench 2 was a thick layer of clayey soil containing animal bones and winkle shells but no oyster shells (which had been numerous in the topsoil). 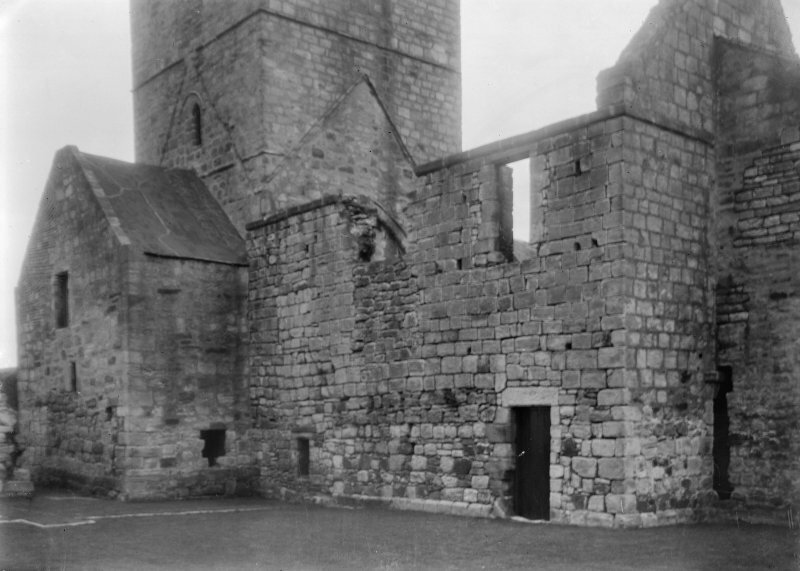 The lower deposit may have been midden material associated with the nearby abbey although more extensive investigation would be needed to confirm this. 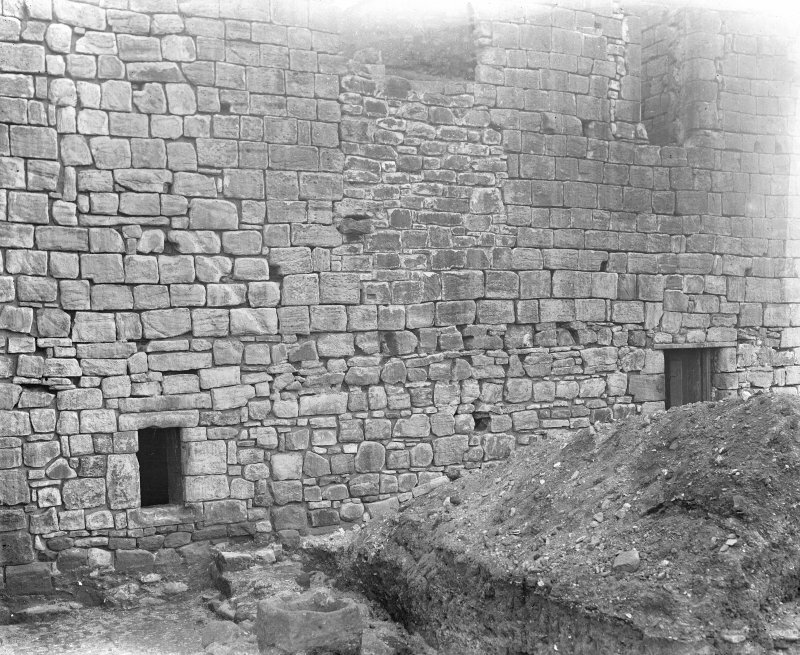 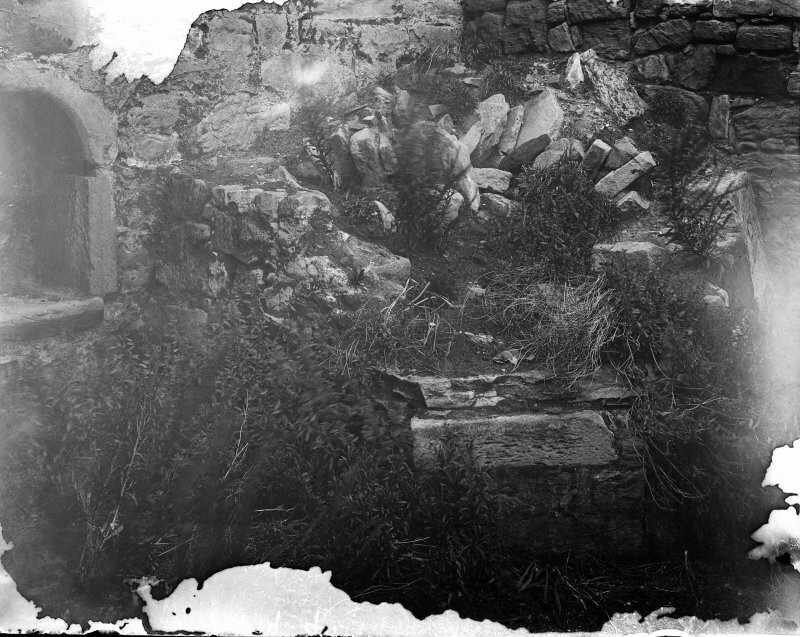 Excavations by the Office of Works. 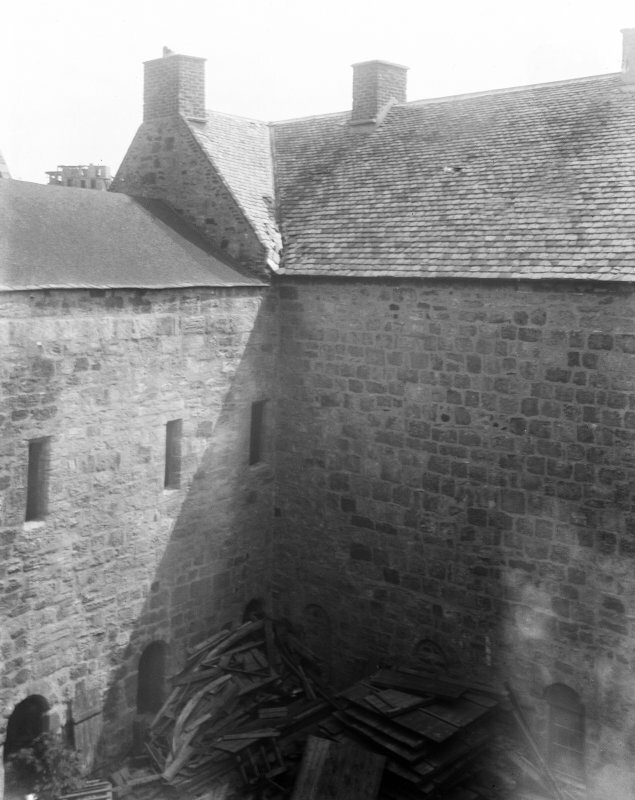 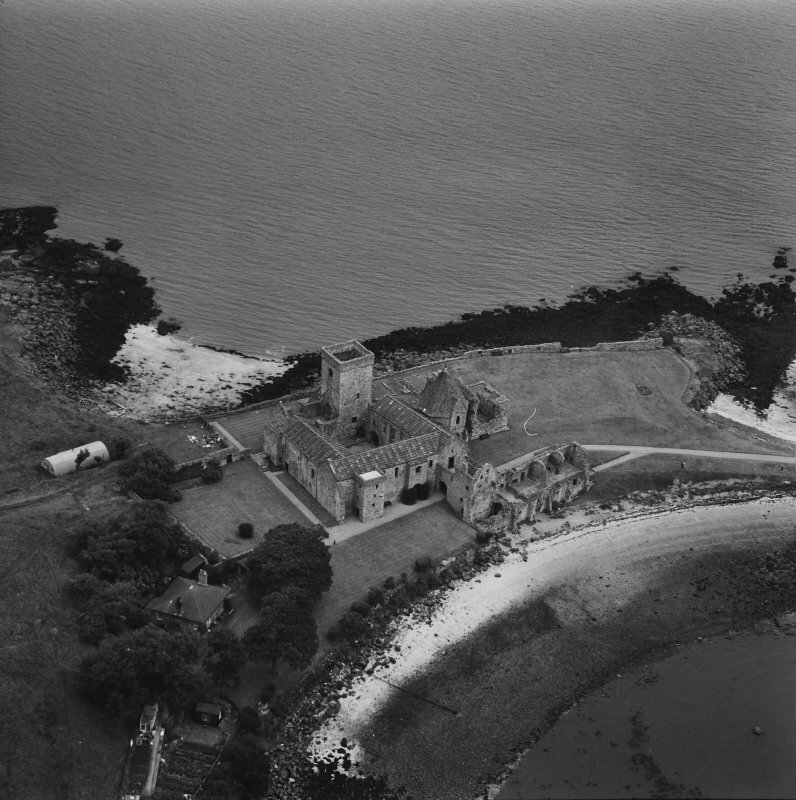 Oblique aerial photographs of Inchcolm Abbey photographed by John Dewar in 1966. 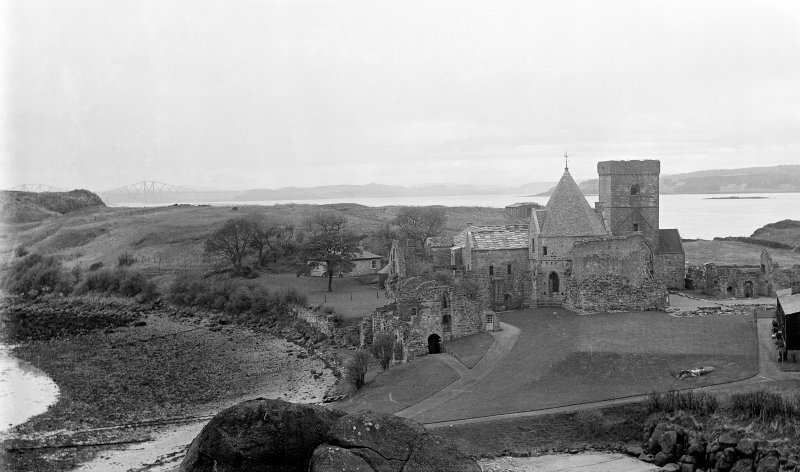 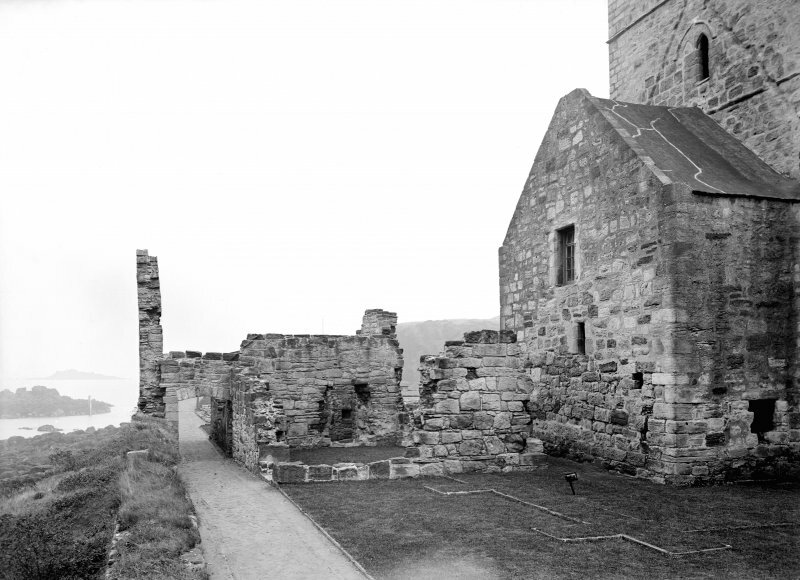 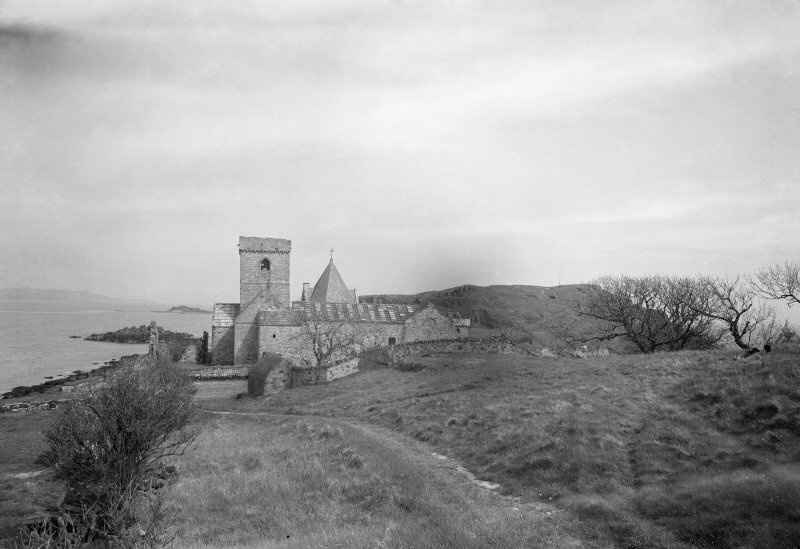 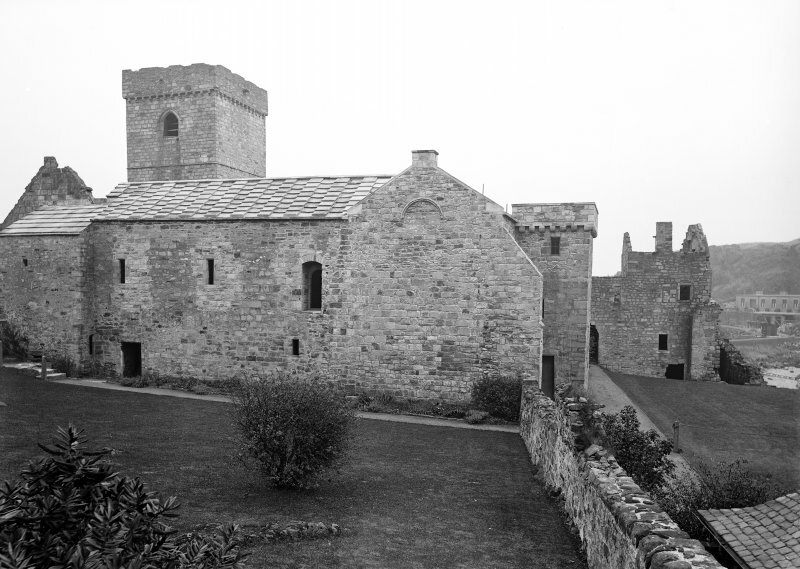 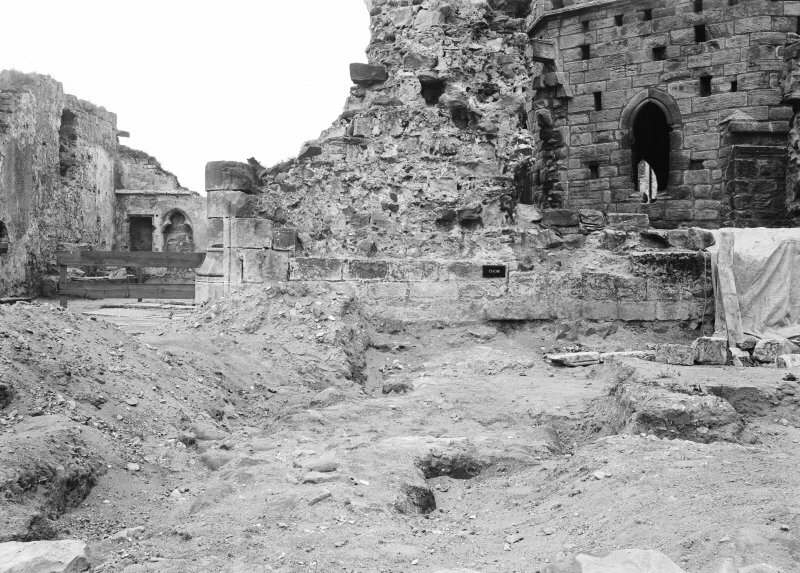 Inchcolm housed a religious community long before the establishment of a monastery in the early 12th century. 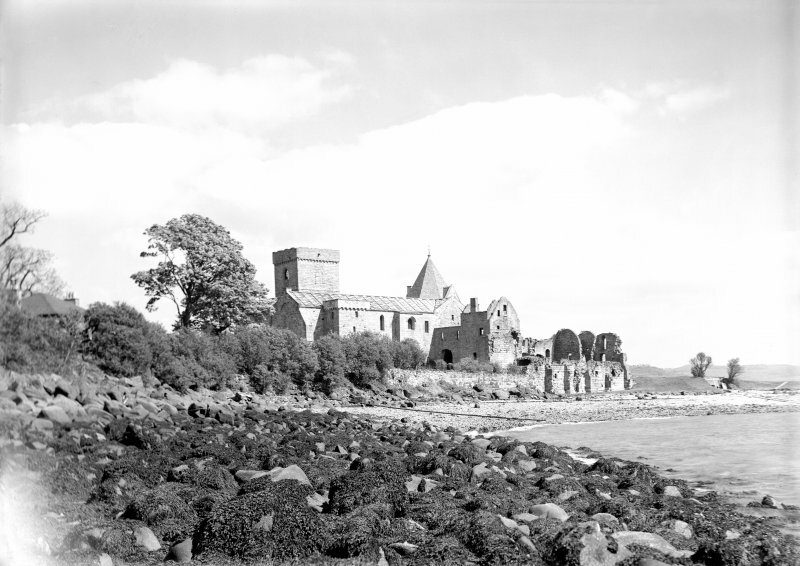 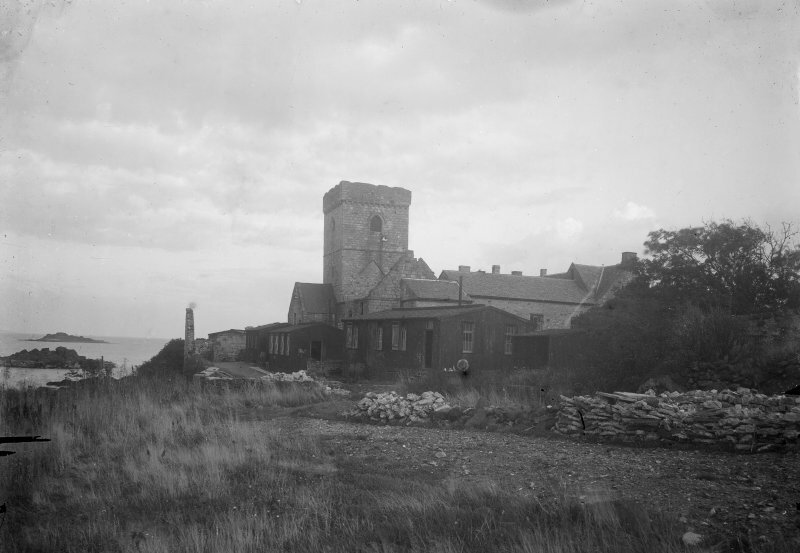 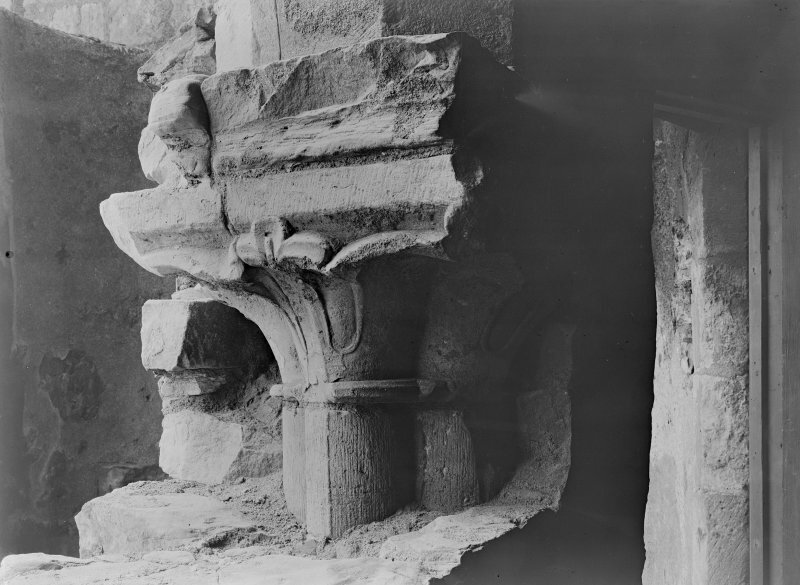 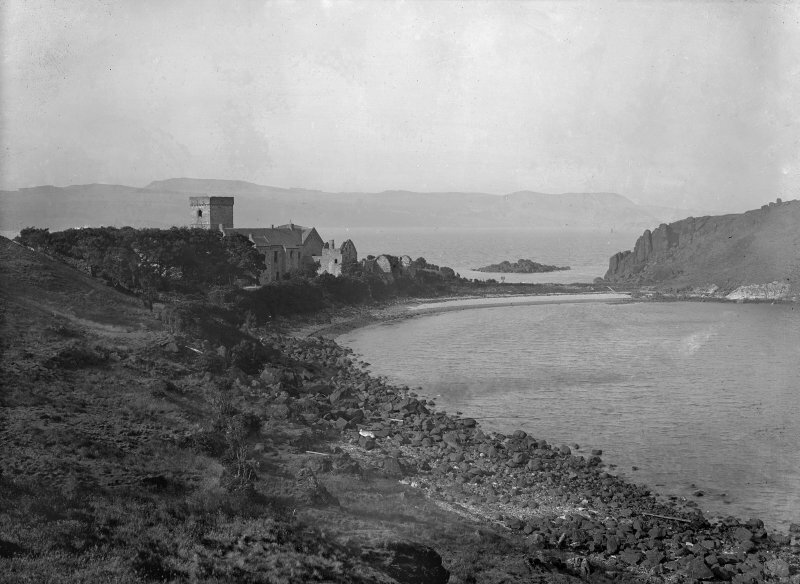 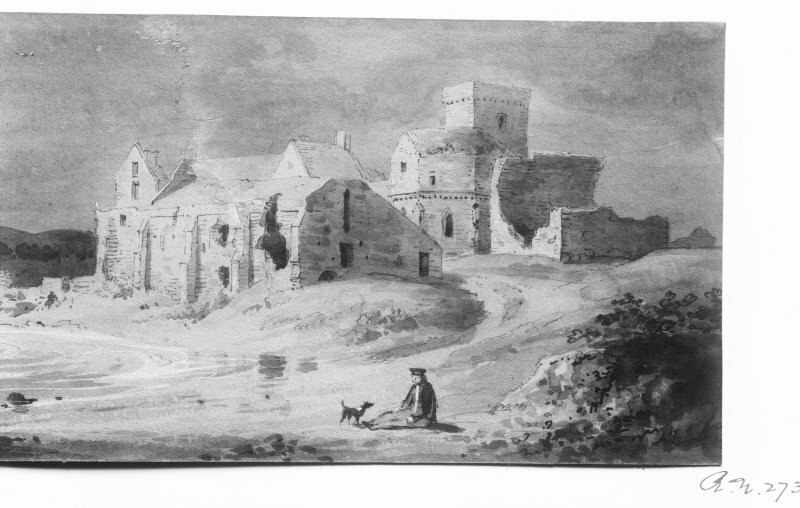 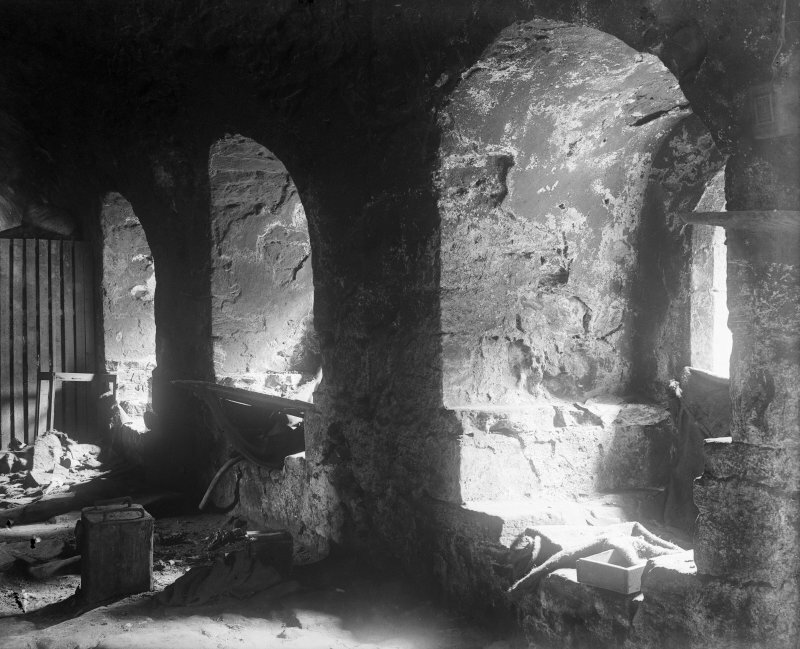 The early inhabitants were hermits devoted to the guardianship of a holy place whose reputation for sanctity stemmed from its links with St Colm, identifIed with St Columba, the 6th century abbot of Iona. 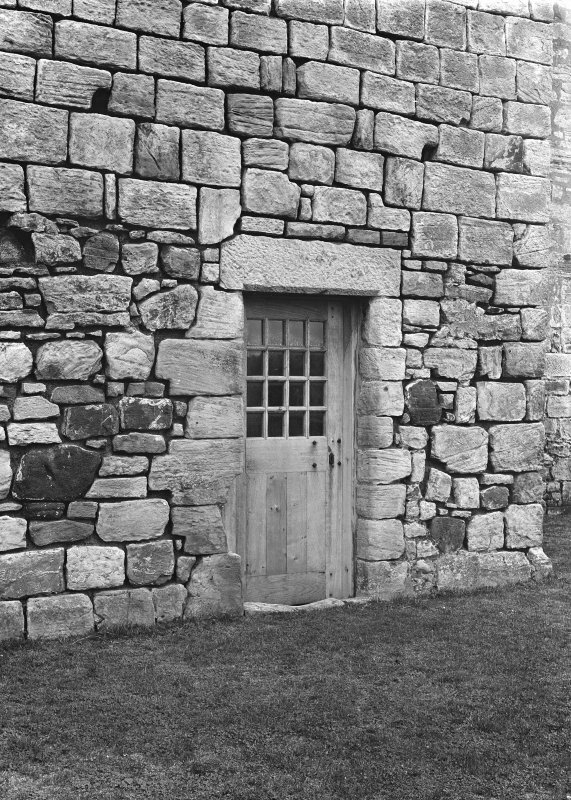 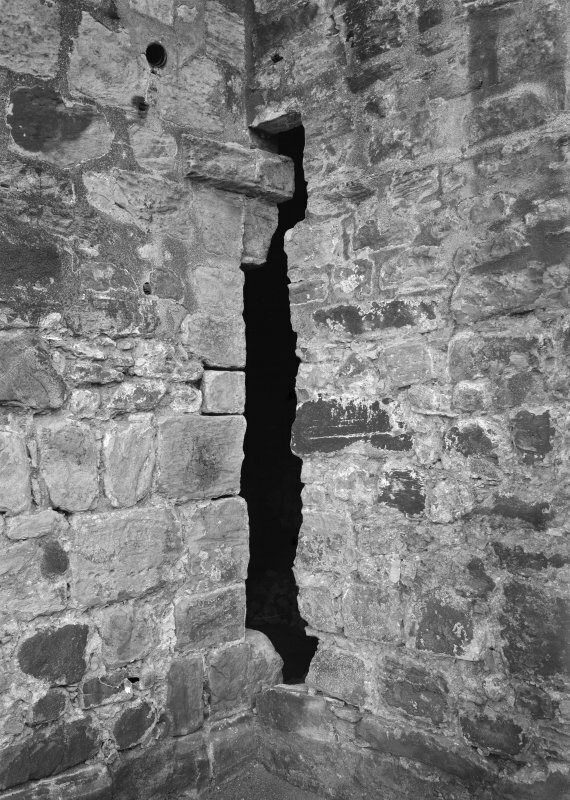 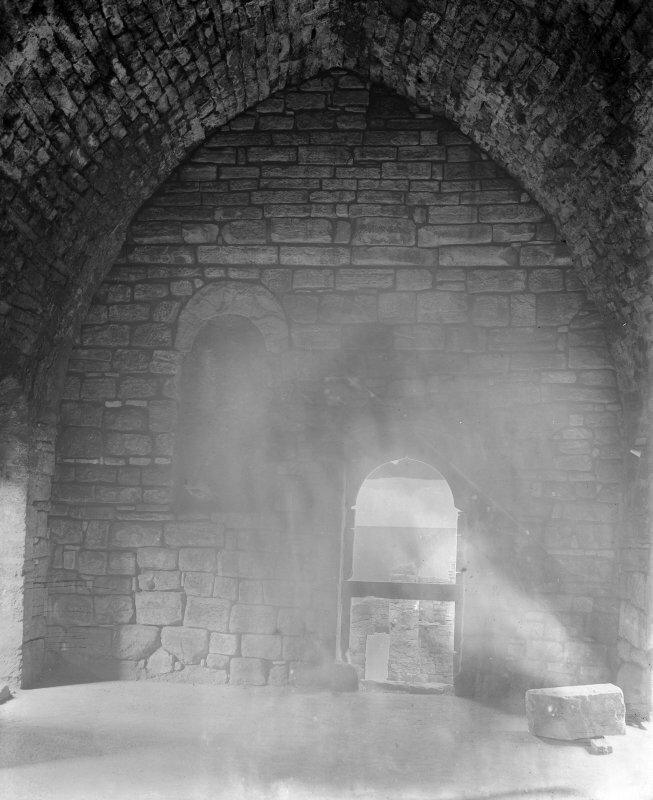 The hermits probably lived in the simple stone cell which survives to the west of the medieval monastery but in an apparently 14th or 15th century restored fonn. 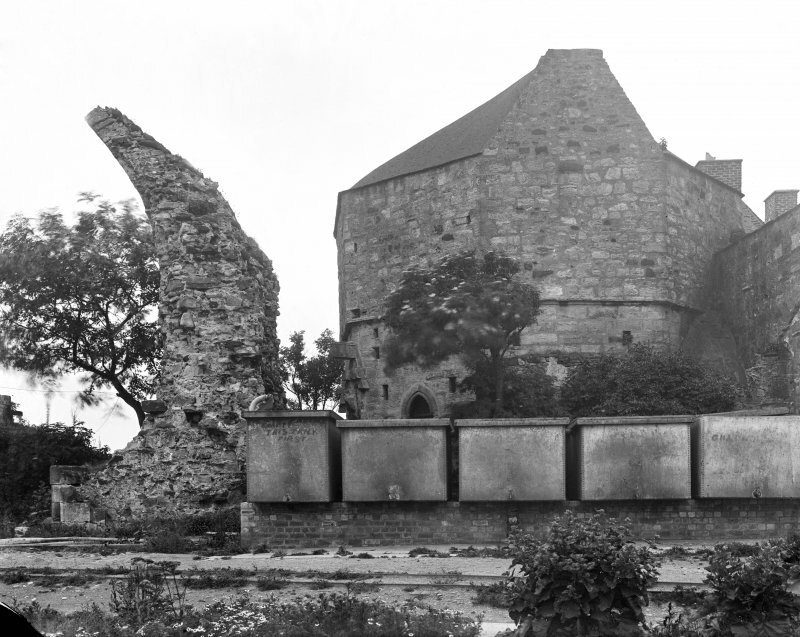 On a knoll beyond the cell there is a fine, though weathered, example of a hogback tombstone; four rows of tegulae, or roof-tiles, are carved along the sides and a great beast's head adorns either end. 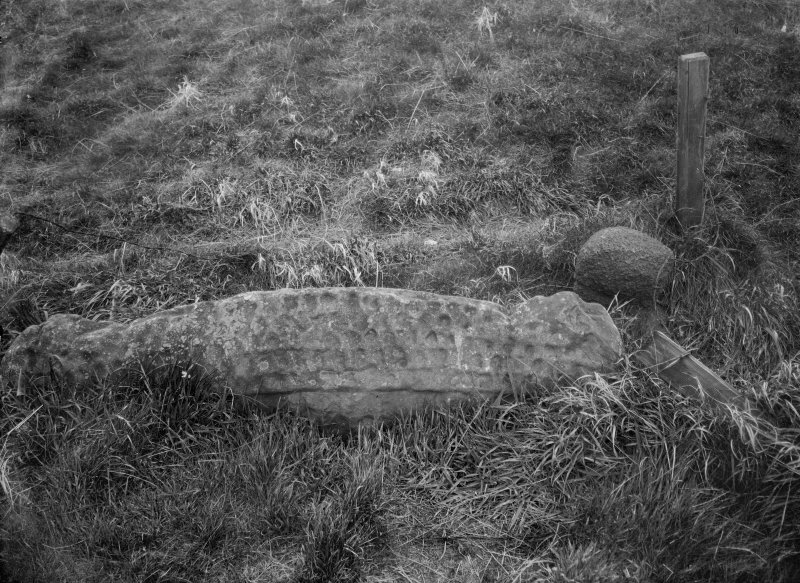 Dating to the mid 10th century, this is probably the earliest hogback to survive in Scotland. 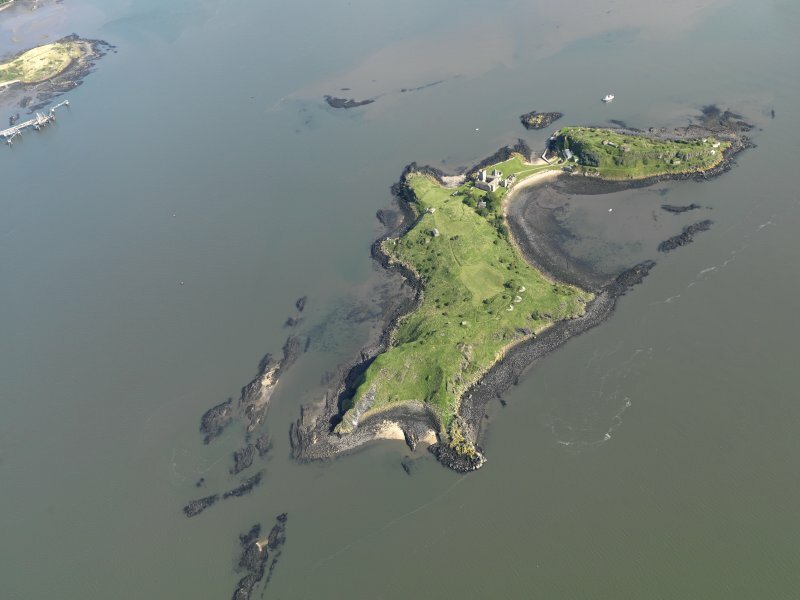 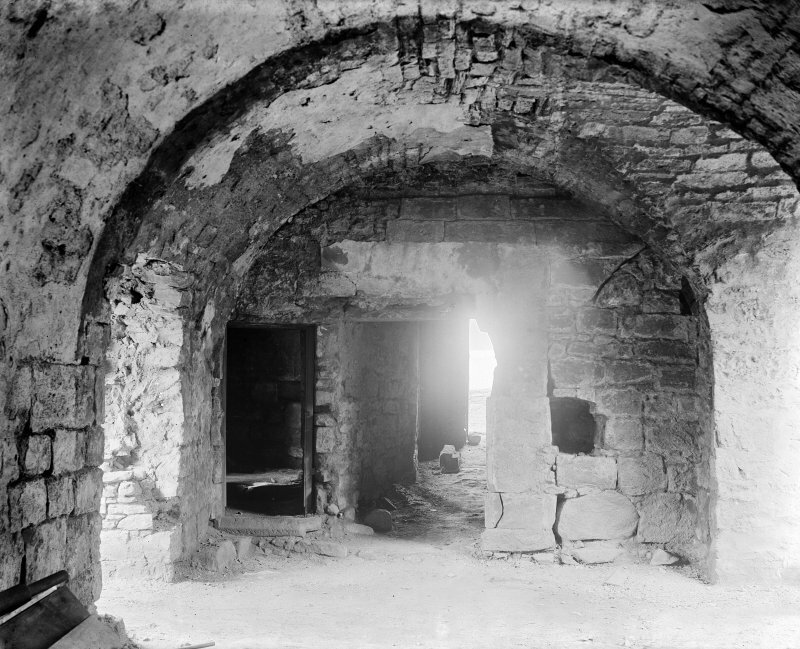 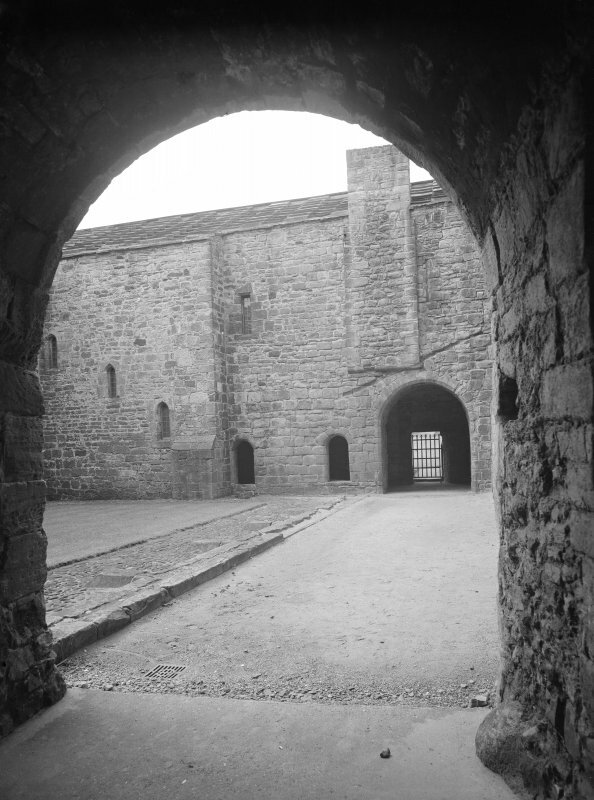 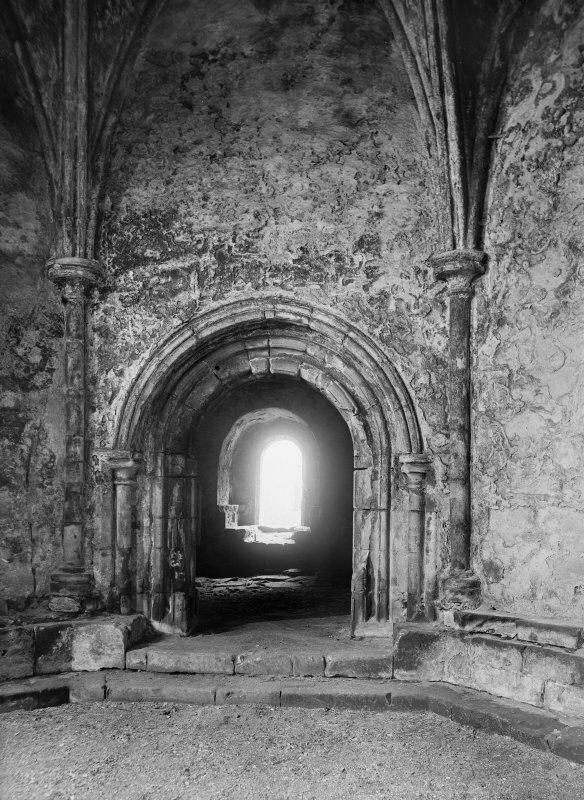 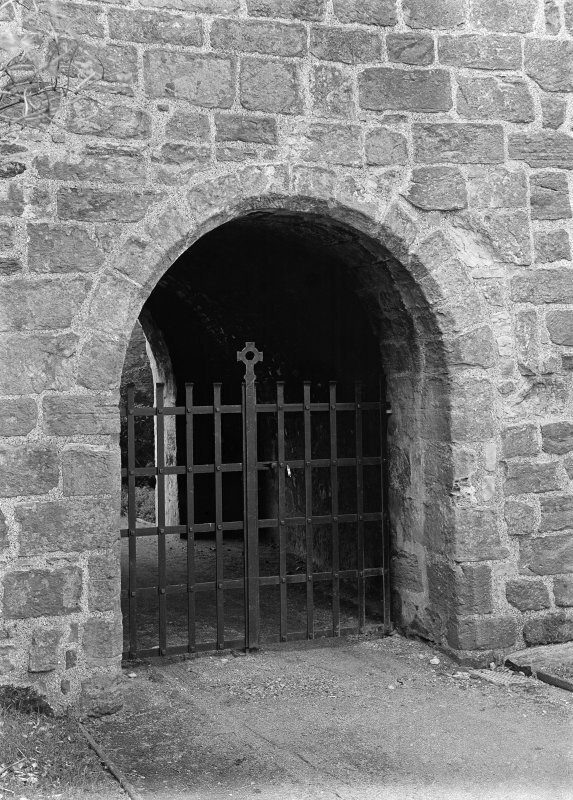 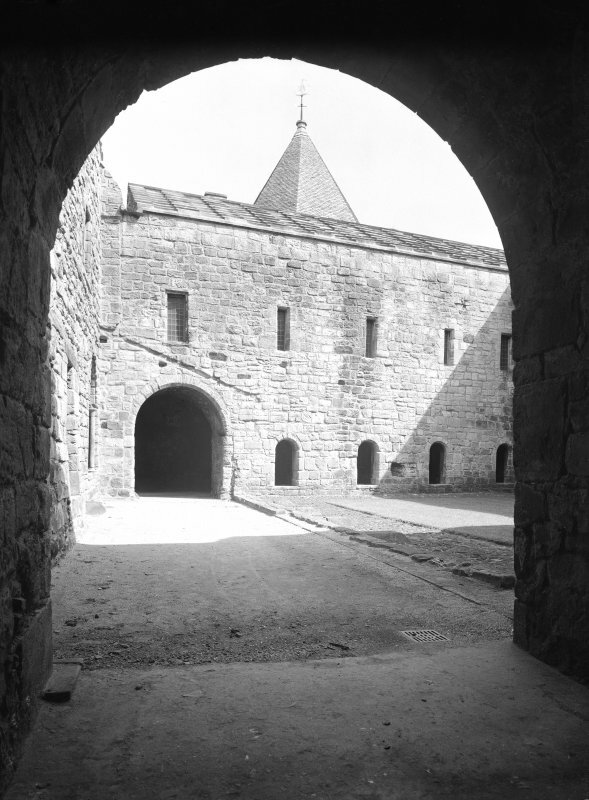 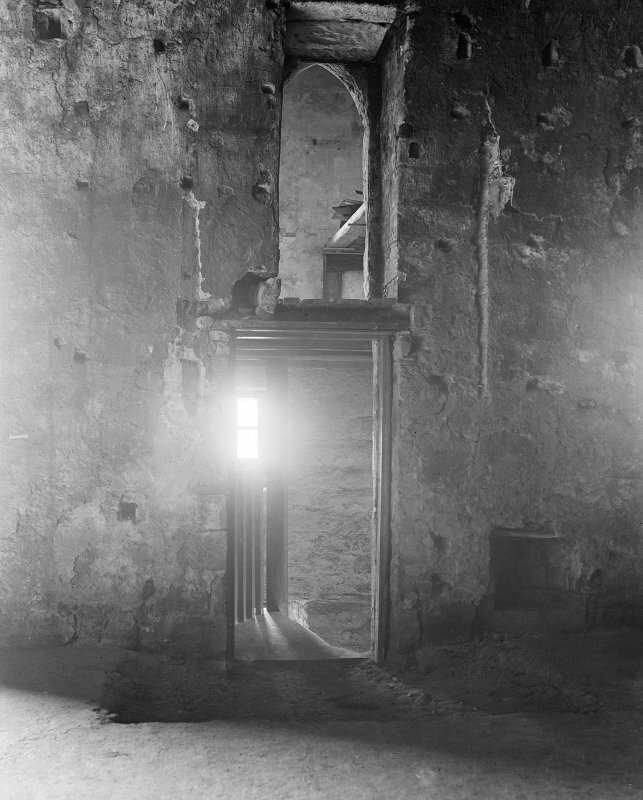 The Inchcolm hermitage received regal recognition in 1123 when Alexander I and some of his courtiers were stonn-bound on the island for three days. 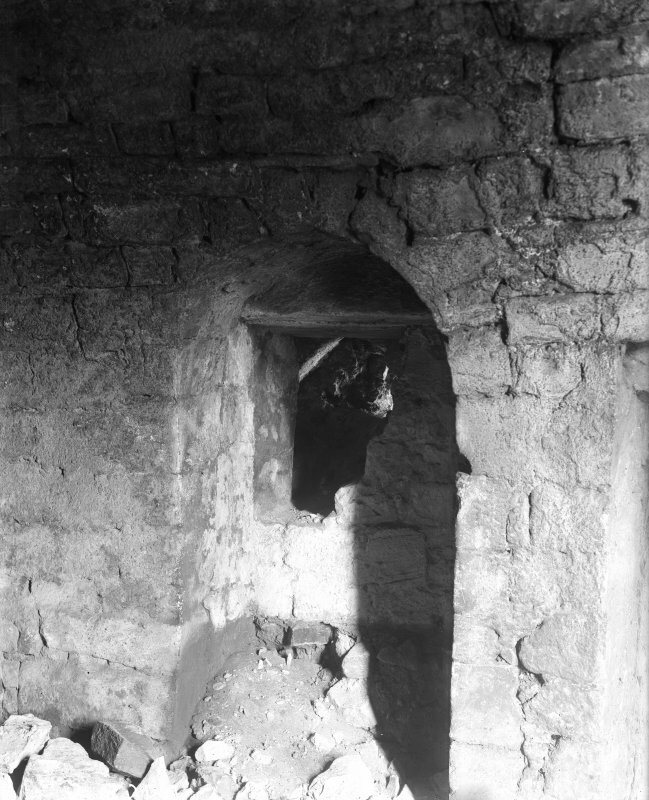 During this enforced visit the hennit sheltered them and shared his scanty provisions. 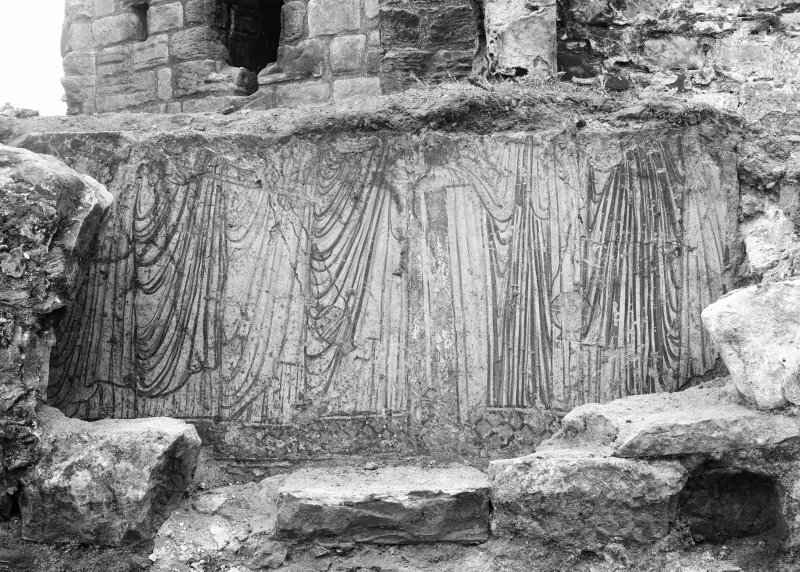 Alexander made plans to establish a monastic settlement but these were interrupted by the King's death the following year. 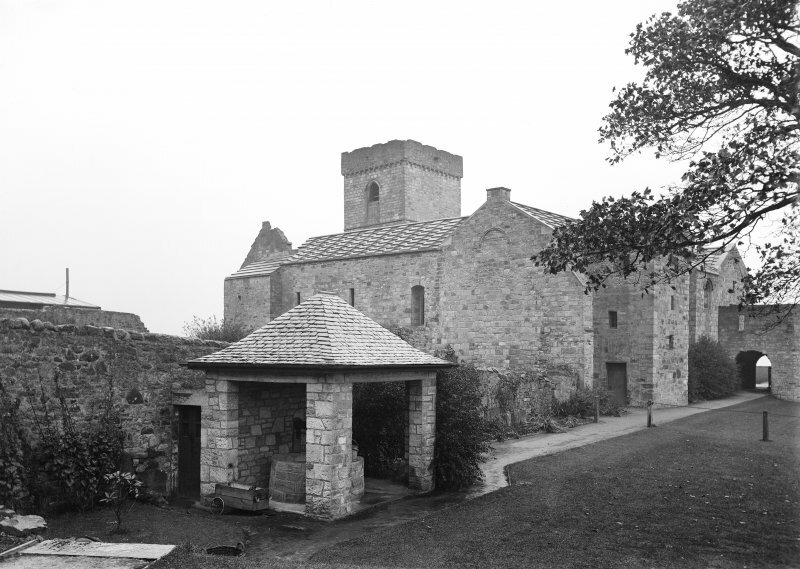 It is not known when the fIrst Augustinian canons settled there but the earliest surviving charter relating to the monastery dates from about 1162-9. 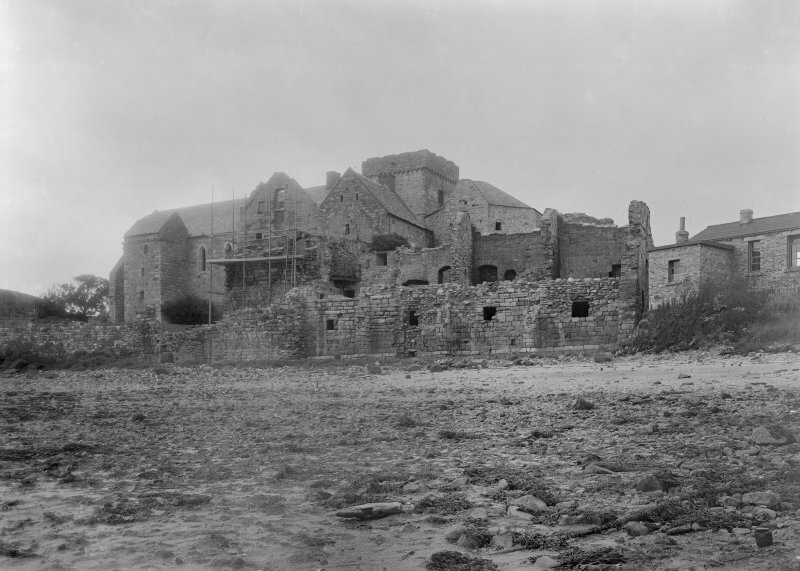 The mid 13th contury saw a period of relative prosperity although it did come under periodic attack during the Wars of Independence. 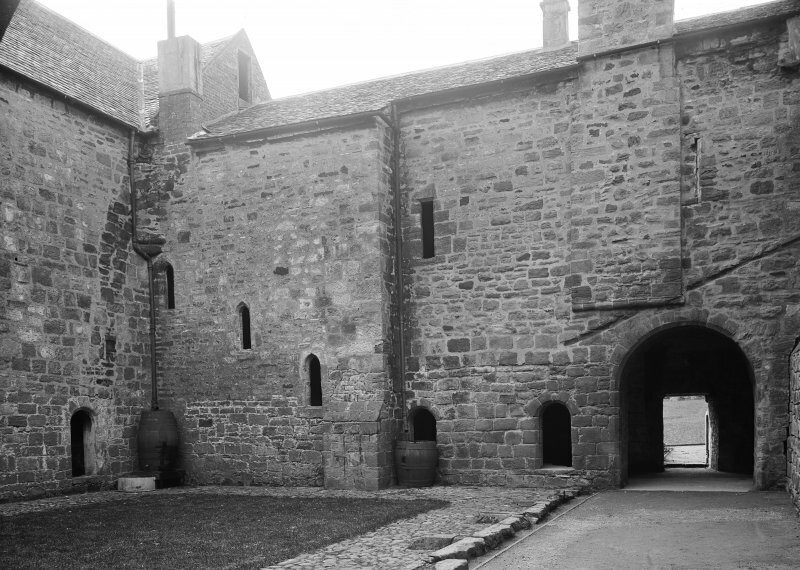 After the Reformation, no new canons were admitted and the last document relating to the monastery dates to 1578. 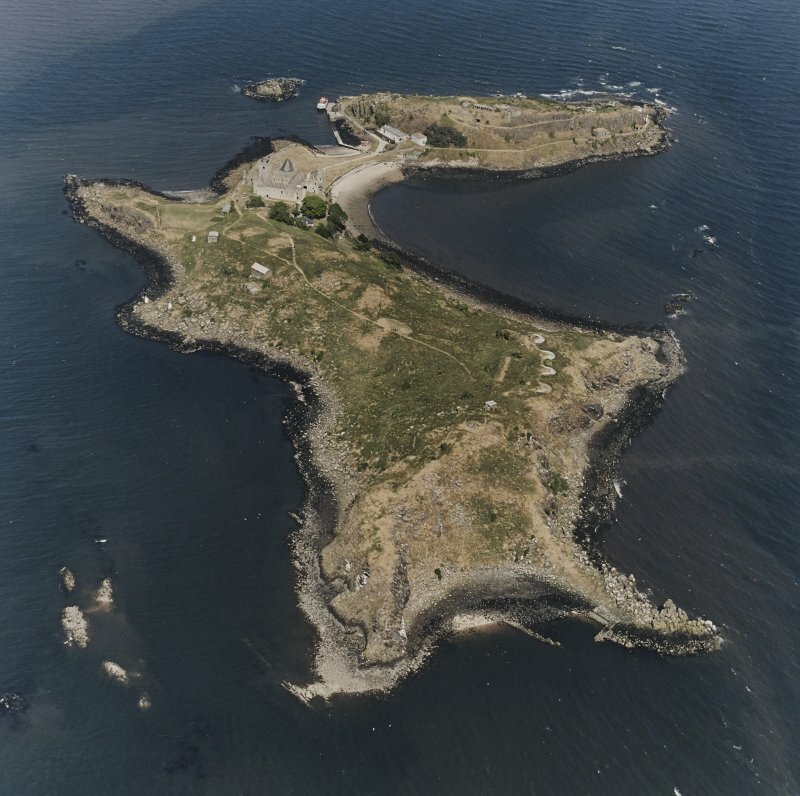 The isolated position of the island is largely responsible for the fme state of preservation of the buildings. 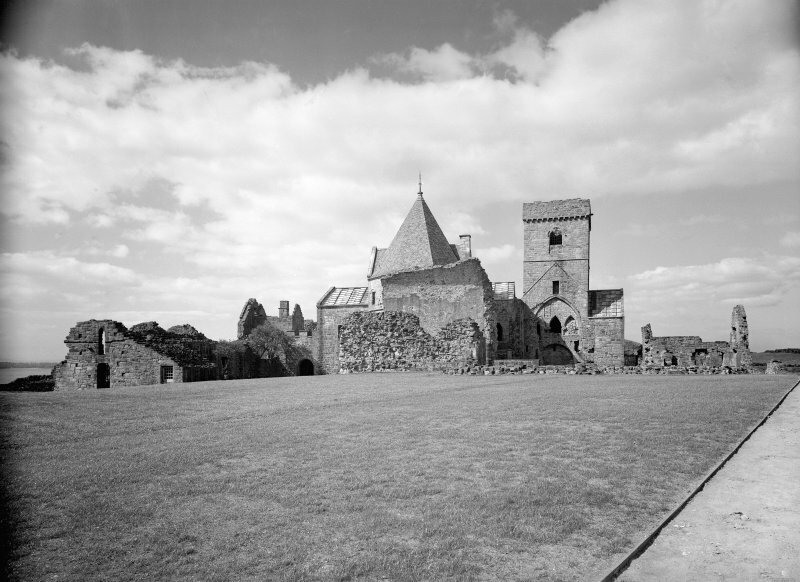 Inchcolm creates in the mind of the visitor an unusually clear and vivid impression of monastic life, despite the fact that the surviving structures belong to several periods of building and modifIcation. 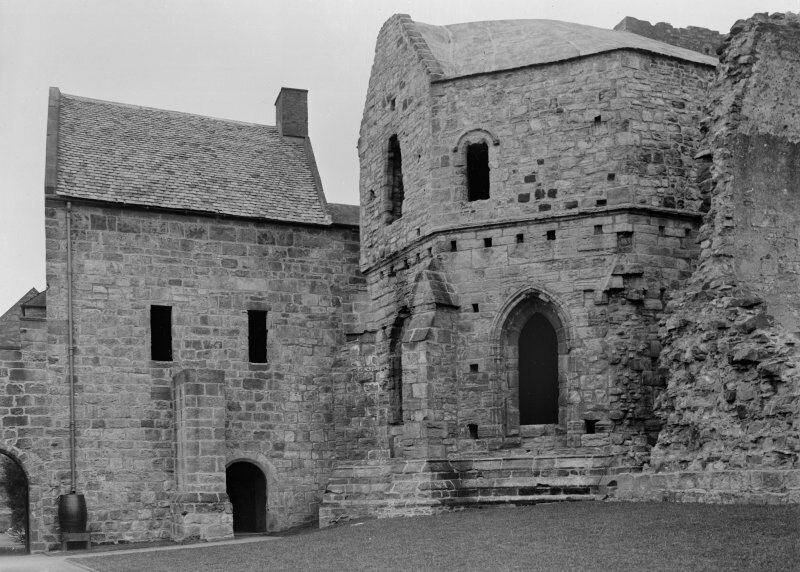 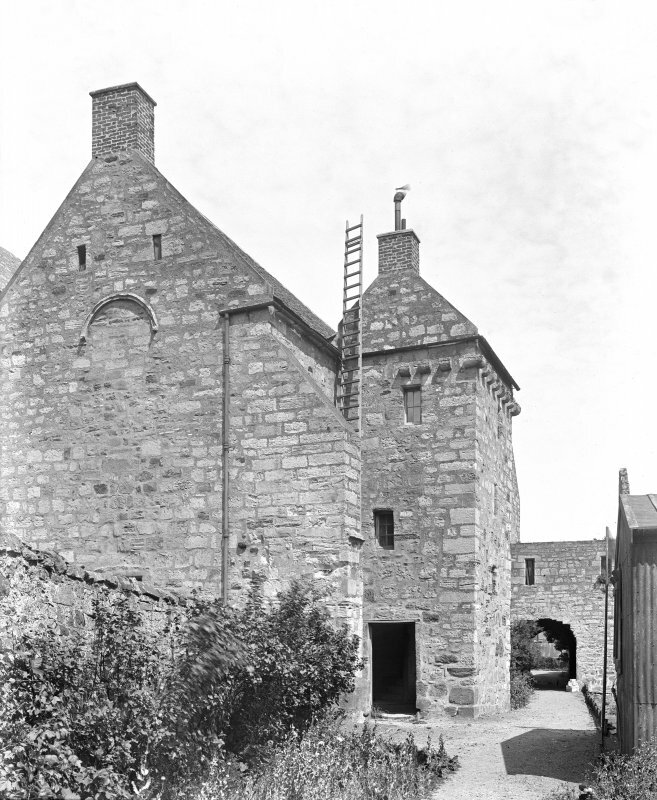 The polygonal chapter-house was built in the 13th century and represents a design fashionable in England but used only three times in Scotland (another example may be seen at Elgin, Moray, and the third was at Holyrood in Edinburgh but no longer exists). 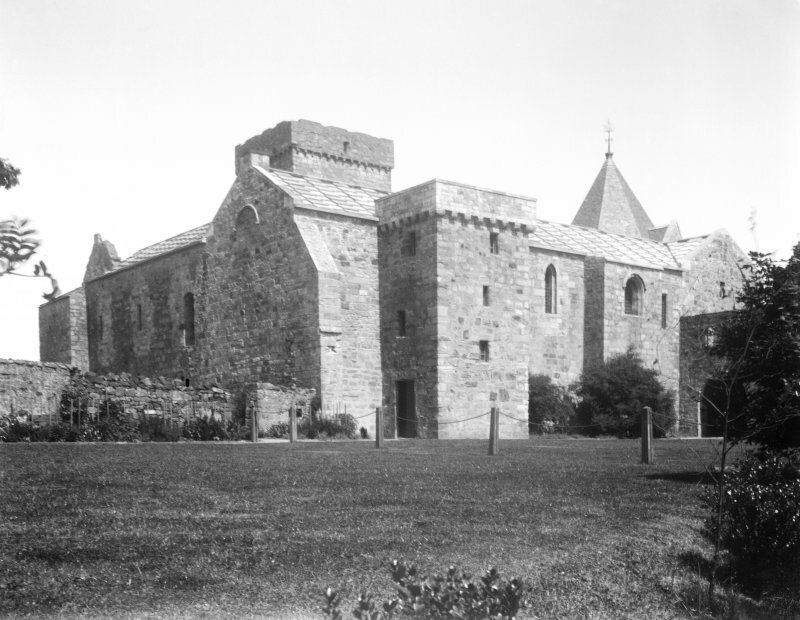 It has a fine ribbed and vaulted ceiling, and the stone seating for the monks still lines the walls. 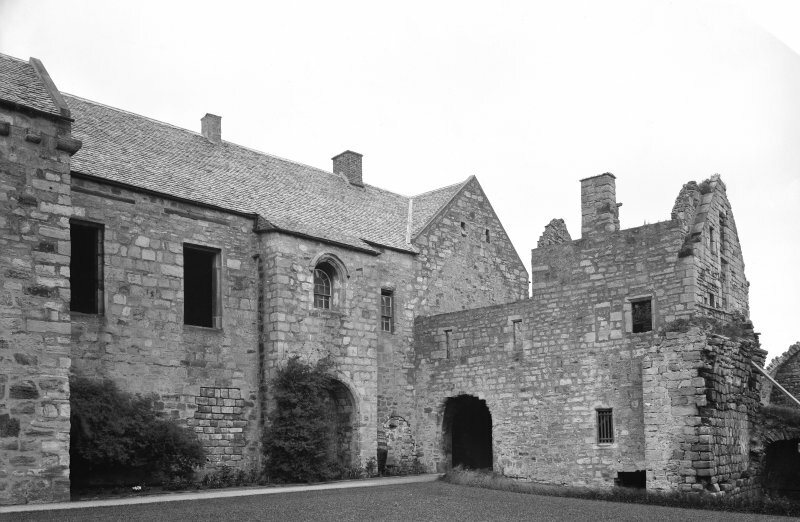 The chapter-house is incorporated into one side of a 14th century cloister, with its open court, covered cloister walk and seats for the monks in the window recesses in which they worked. 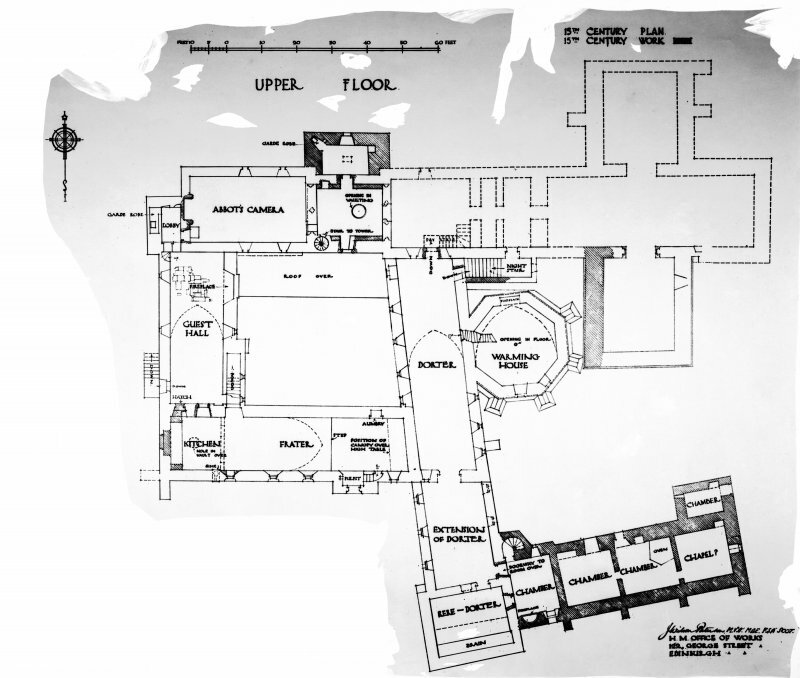 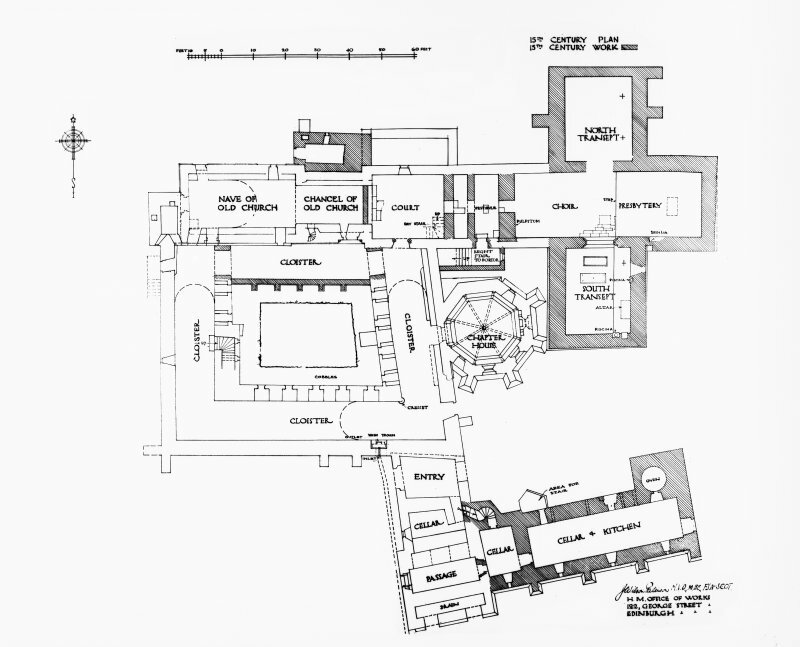 The upper floor contains their living quarters, including a warming house with a fireplace over the chapter-house. 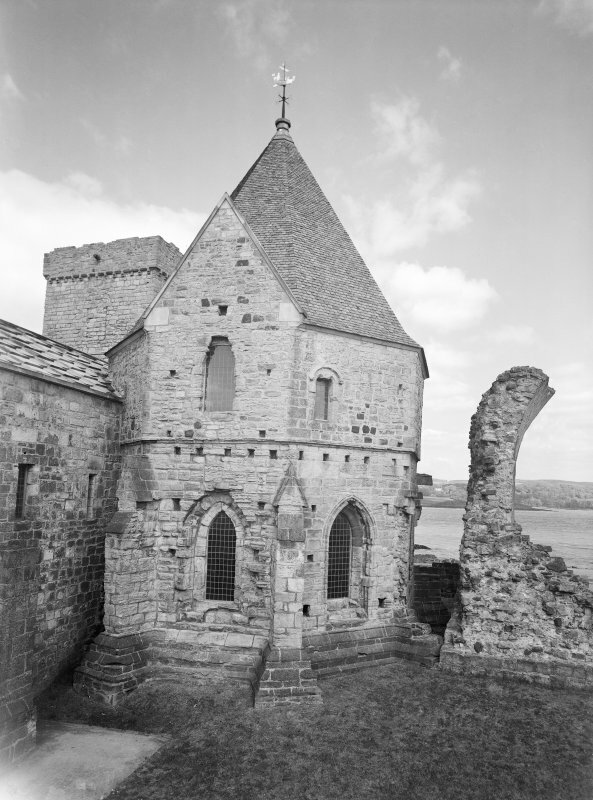 The church has undergone much rebuilding and enlargement since its foundation in the 12th century. 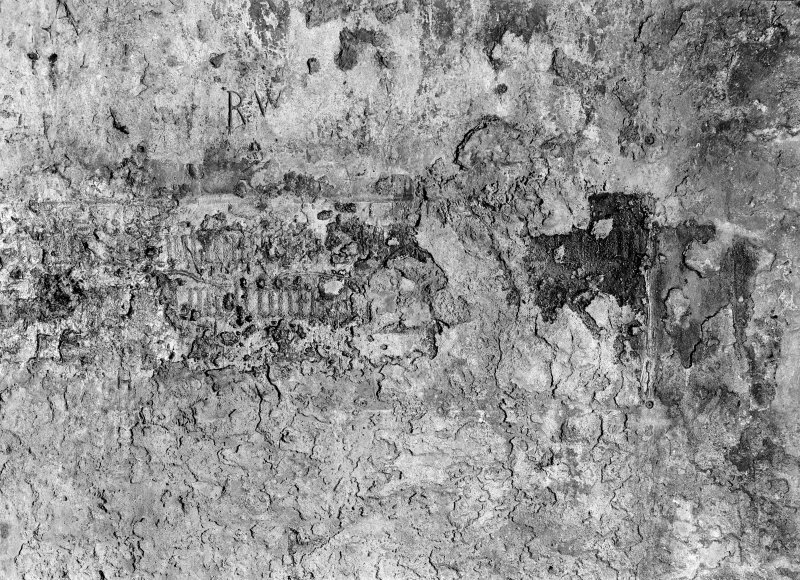 A rare feature is the fragment of 13th century wall-painting with clerical figures outlined in black, red and yellow, preserved by having been sealed behind masonry during a later extension of the church. 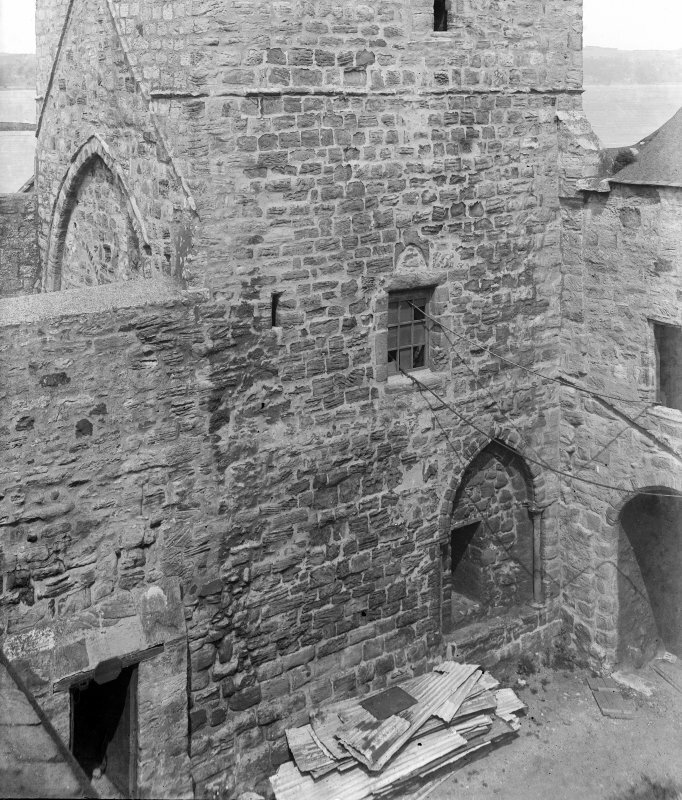 NT 18973 82656 This collection, which consists of a wide range of stones from arcades to window tracery, was assessed during July–August 2010. 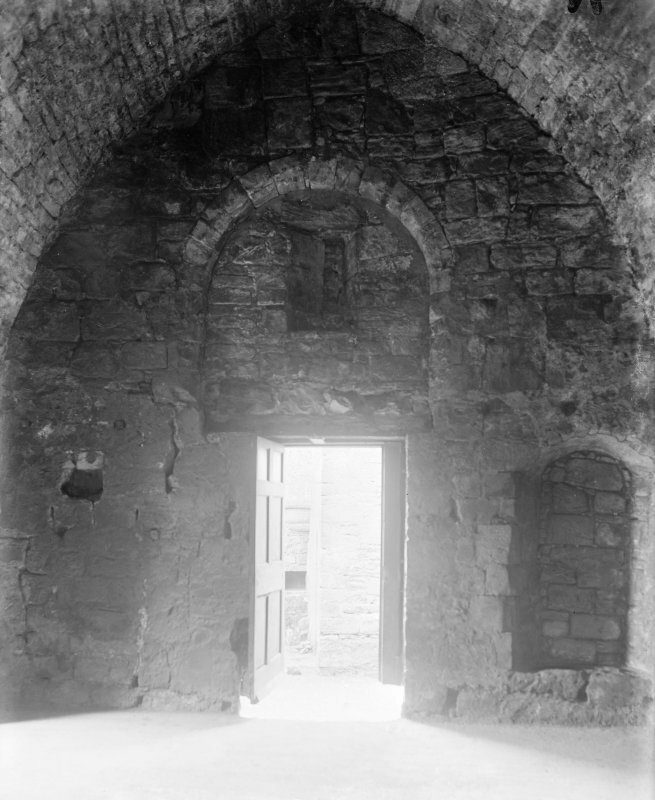 The arcade stones, of which there are four, form the springers for a series of arches. 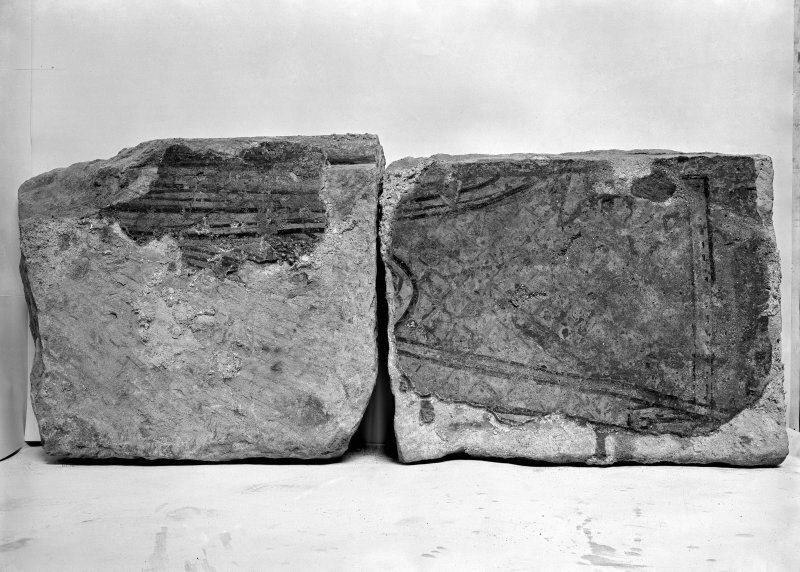 The profile of these stones is related to that of a string-course fragment, also in the collection. 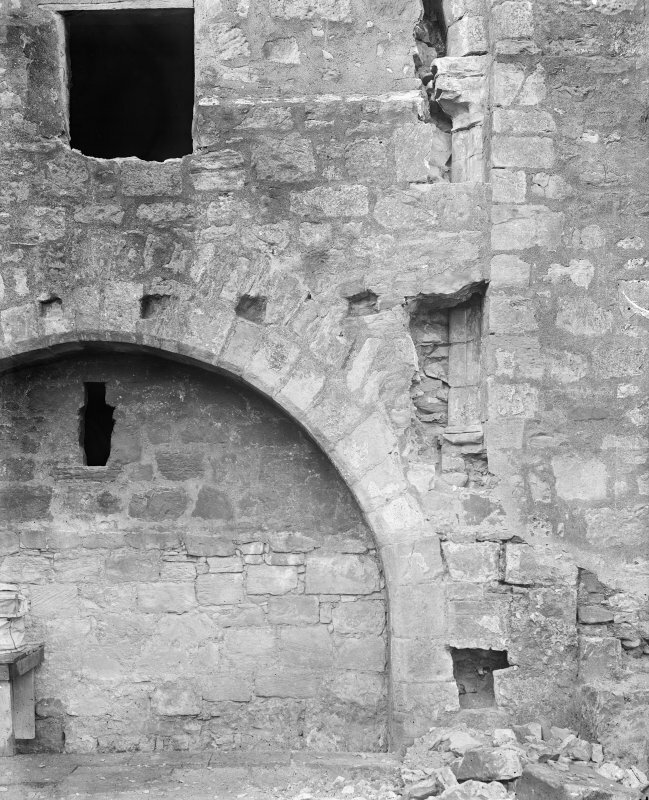 This string-course may have come from the chapter house exterior, and it is therefore possible that the arcade stones came from stalls on the interior of the chapter house. 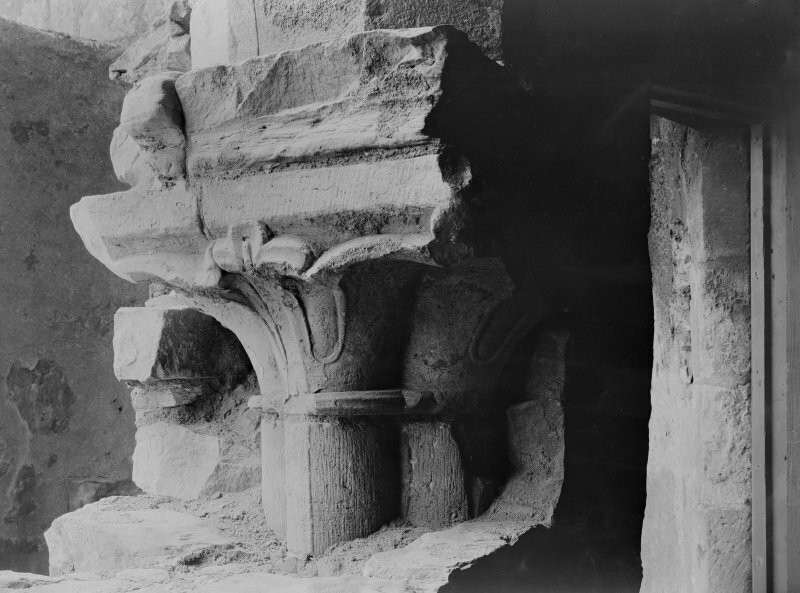 A very unusual item was a mass dial, broken into two pieces. 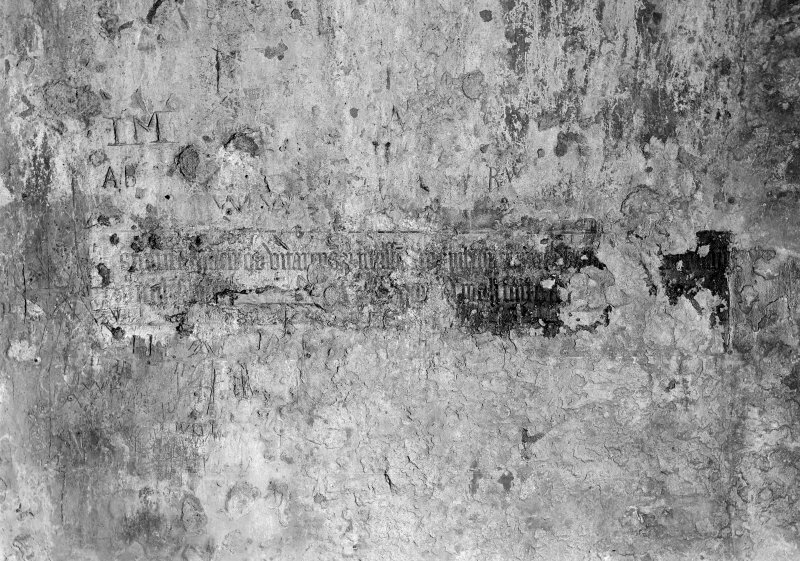 This has a series of incised radiating lines, and the remains of a gnomon in the centre. 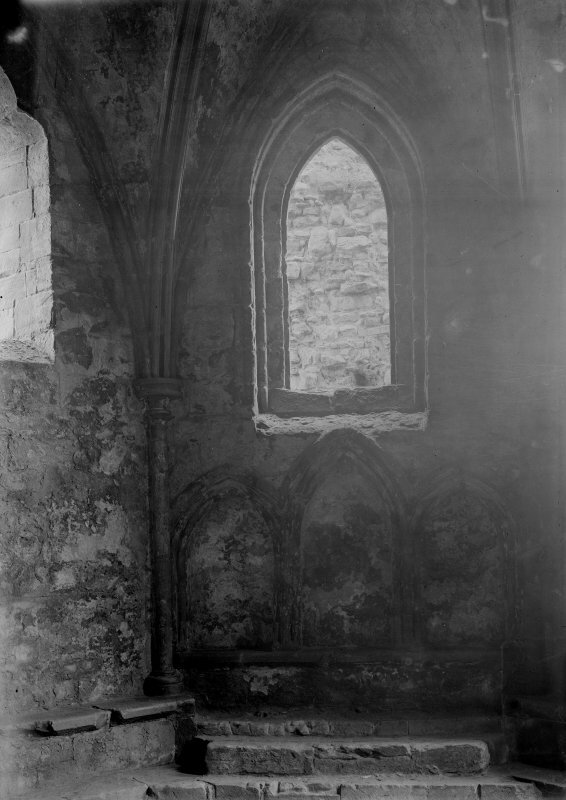 Although mass dials are well known in English churches they are relatively rare in Scotland. 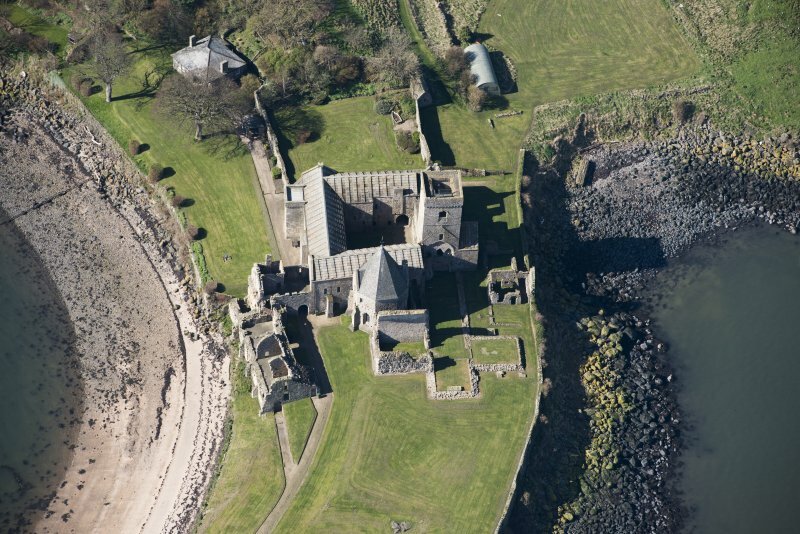 NT 1903 8265 (centred on) A watching brief was undertaken on 10 May 2010 during the installation of new signs at Inchcolm Abbey. 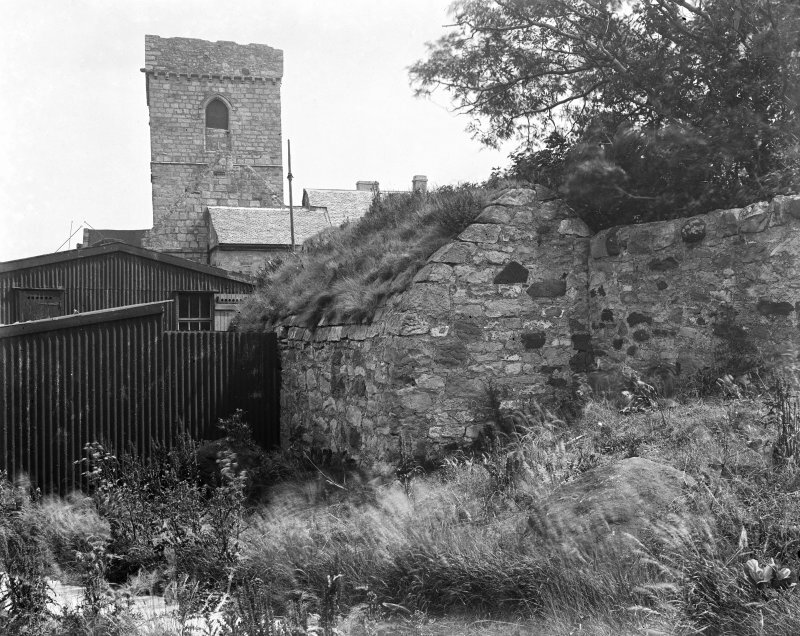 Shallow trenches were excavated to house the new signs and the existing weathered signs removed. 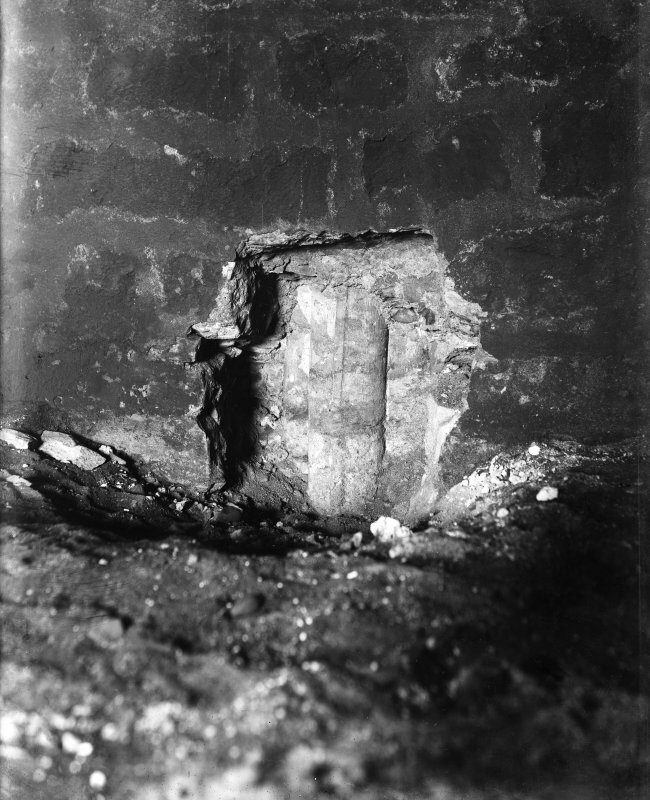 Some evidence of WW2 activity was uncovered during the work. 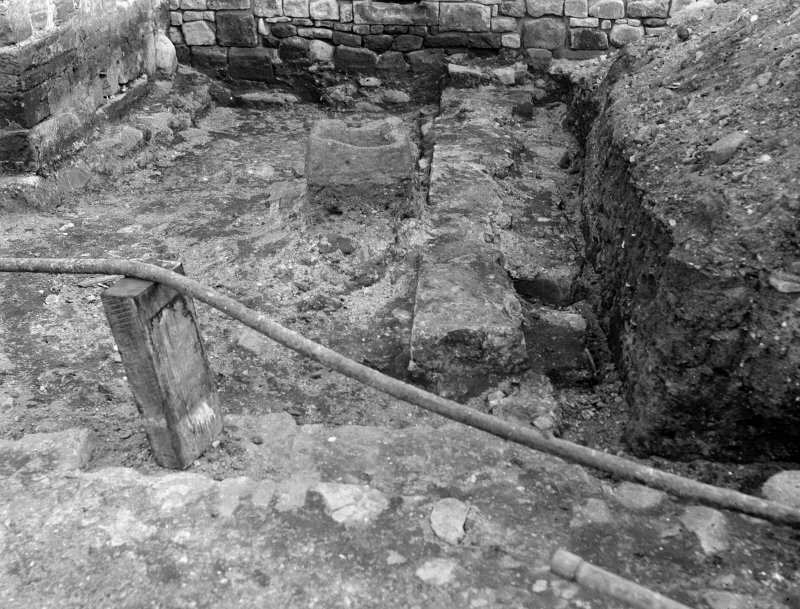 A pre-excavated cable trench was inspected and recorded by CFA. 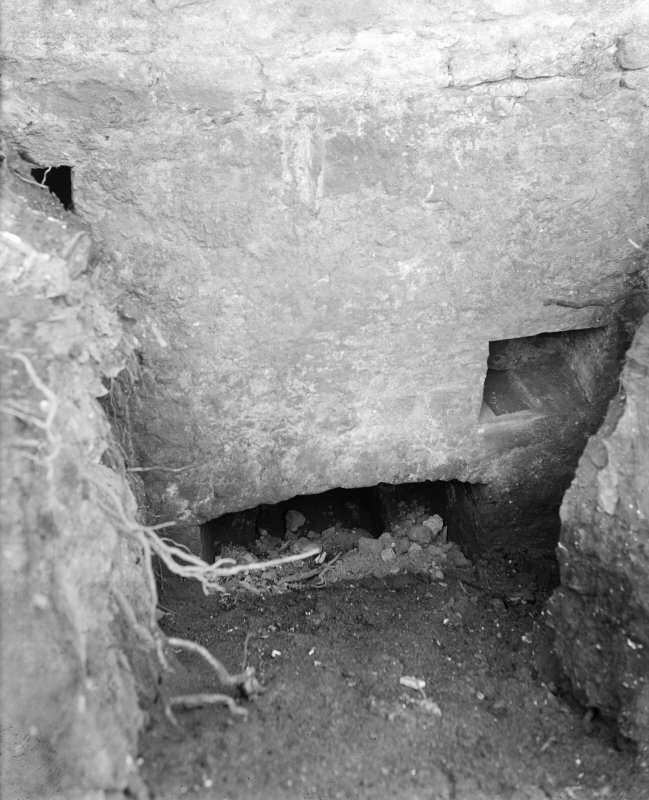 A further section of the trench was monitored under a watching brief. 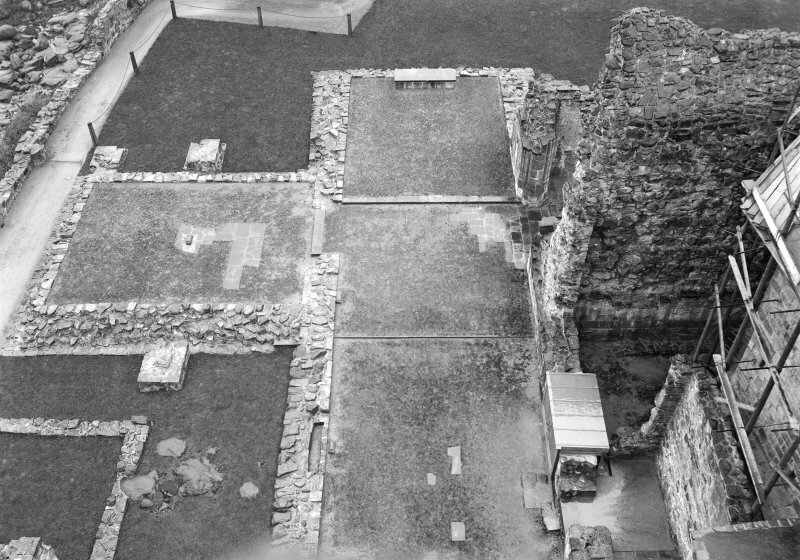 The remains of a randomly laid brick surface was identified under the existing path. 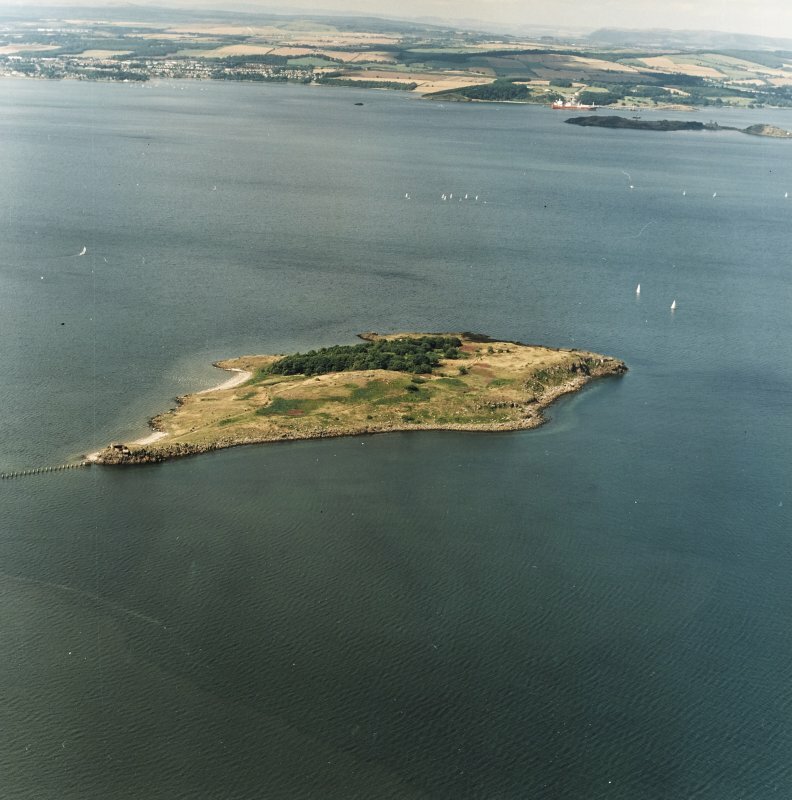 No other features of archaeological significance were identified, likely due to the overall shallowness of the trench (up to 0.3m deep) and disturbance from wartime activities.